From the Mountain and Pacific time zones, we move to the greater Midwest with images taken in Missouri, Oklahoma, Texas and a sliver of Illinois. Be sure to click on individual images for larger views. Beginning at Kansas City’s old municipal airport (MKC, since renamed Charles B Wheeler Downtown Airport), I only took a few pictures, and combine them with others from friends. 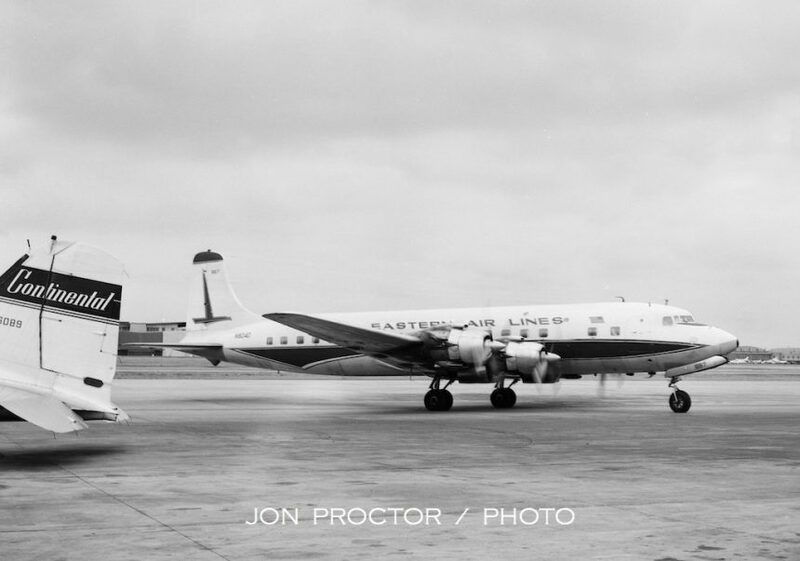 Here’s a great timeline shot from the mid- to late 1950s, showing of a trio of DC-3s belonging to Central Airlines, Ozark Air Lines and Frontier Airlines, a bit overshadowed by the tail of a United DC-7. My good friend Allan Van Wickler’s photos can also be found on my New York Through The Years page. 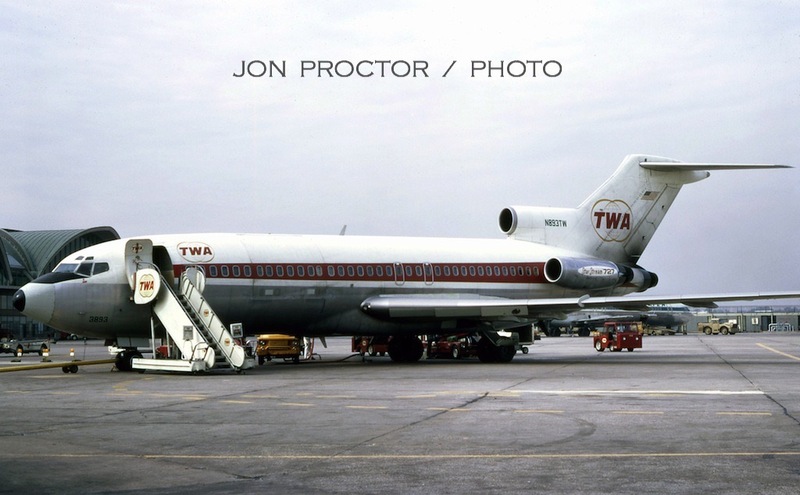 On October 28, 1965, I was about to board a TWA flight back to LAX following my first Kansas City visit. Braniff BAC 1-11 N1550 was the only subject that found my camera lens that day. 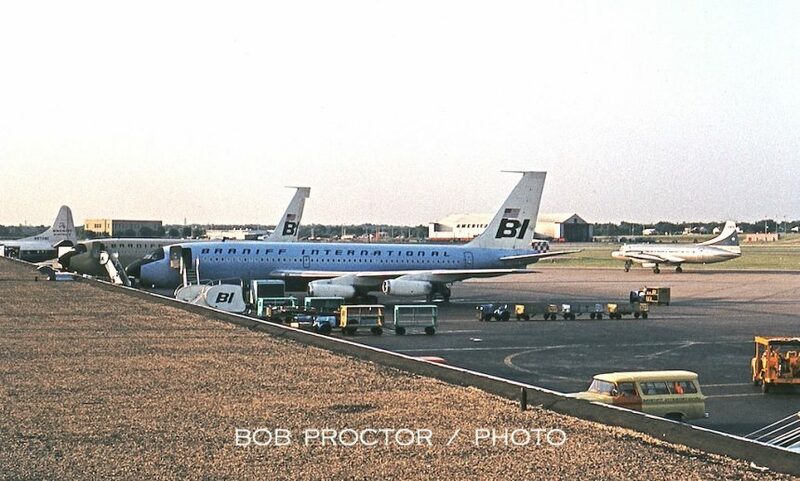 Below is another reminder of how easy it was to sneak out on the ramp for a quick picture of the same airplane. And yes, that’s the nose of a Frontier Convair 580, plus a Braniff DC-6 on the left. 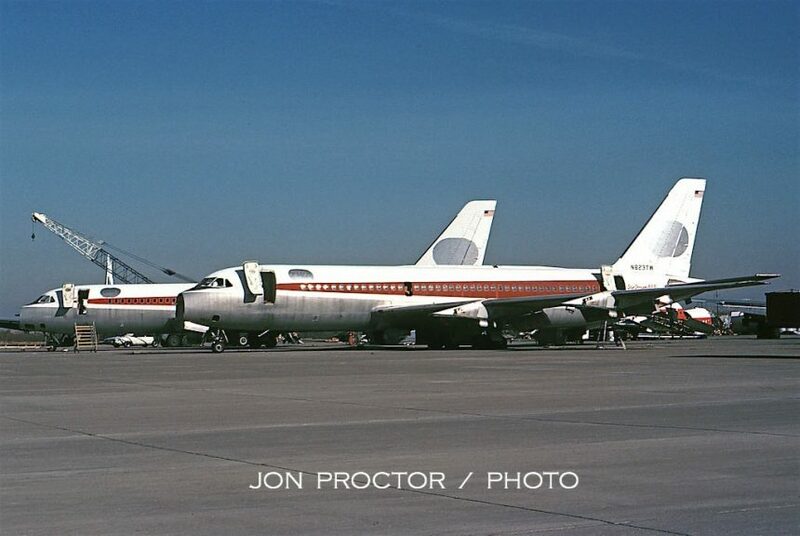 N1550 migrated to Allegheny and was written off after a non-fatal overrun on landing at Rochester in July 1978. 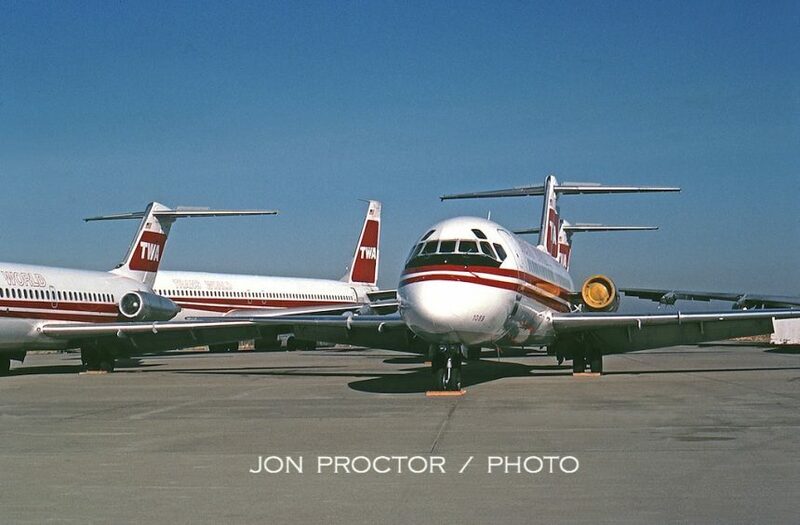 Another treasured friend, the late Dean Slaybaugh took this picture of the pair of Lockheed 1329 JetStars TWA purchased in 1968 for pilot training. One was outfitted with a cockpit layout simulating a Boeing 707 and the second a 727. In the end, the cost savings from using smaller planes did not offset upkeep and they were sold. 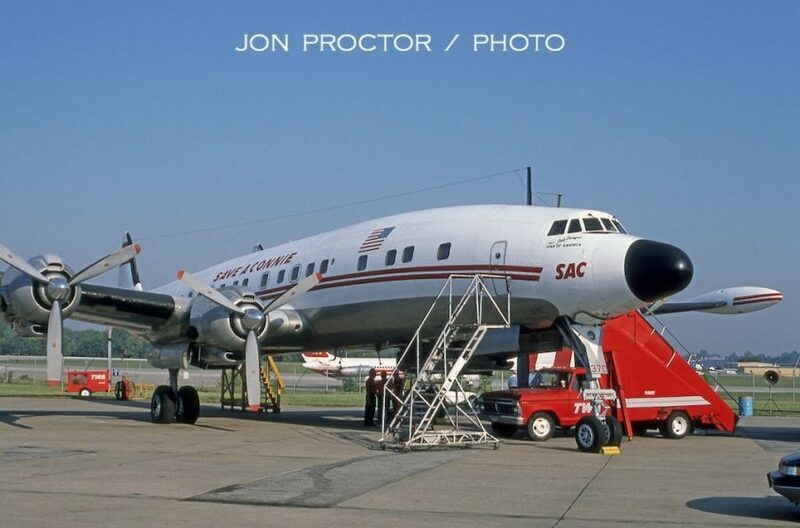 Incidentally, the background hangar now houses the National Airline History Museum, formerly known as Save-A-Connie. Dean caught DC-9-15 N1070T in May 1972. 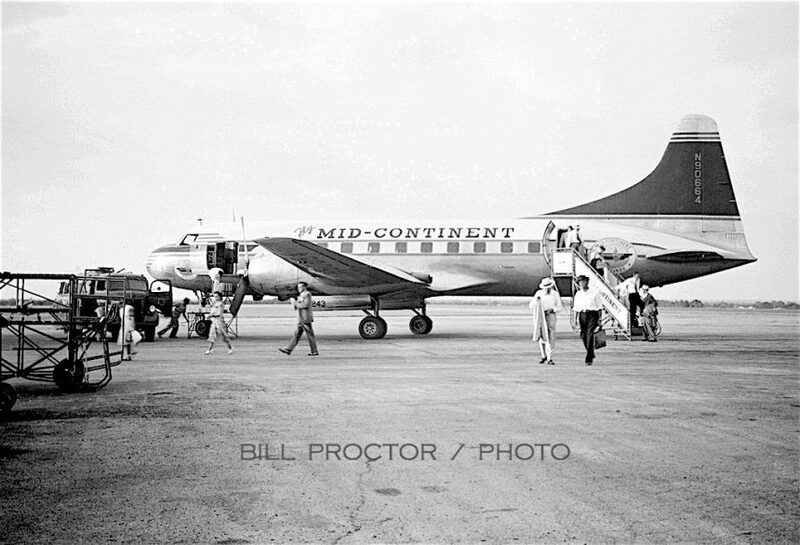 Kansas City International was originally named Mid-Continent International Airport, hence its code: MCI. 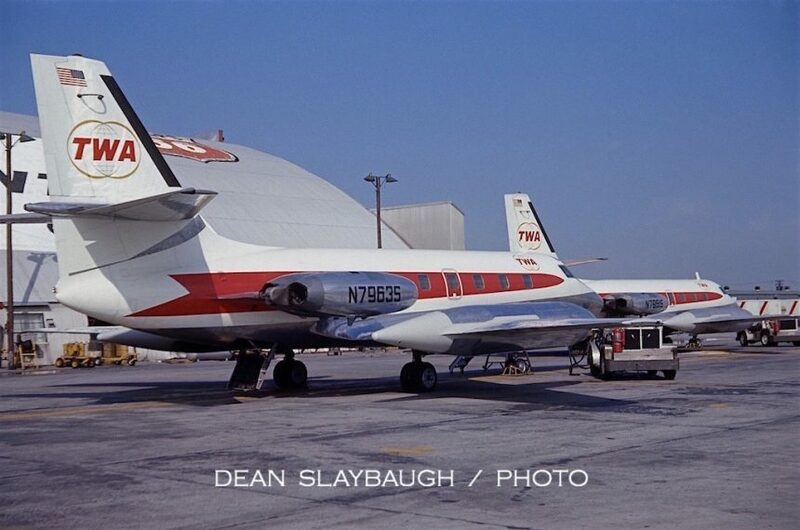 It opened in 1956 as home to TWA’s overhaul base, which was moved from the old Fairfax Airport at Kansas City, Kansas. 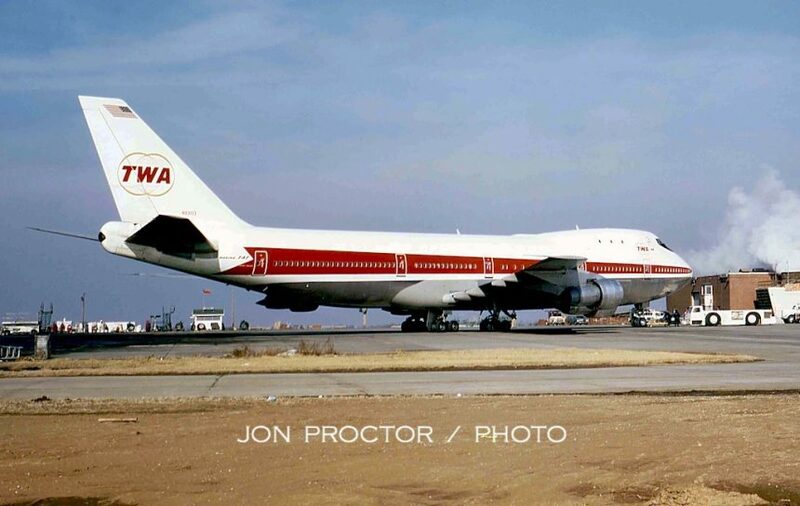 On January 14, 1970, I stopped by to see TWA’s new 747 for the first time, Two airplanes were delivered the previous New Years Eve, in anticipation of service startup February 25. N93102 was about to depart on a pilot training flight, still wearing “EXPERIMENTAL AIRWORTHINESS” markings at each door. Seen above and below, sister ship N93103 flew the 747 route proving schedule starting February 2. See my LAX Through The Years page for pictures of it that day. 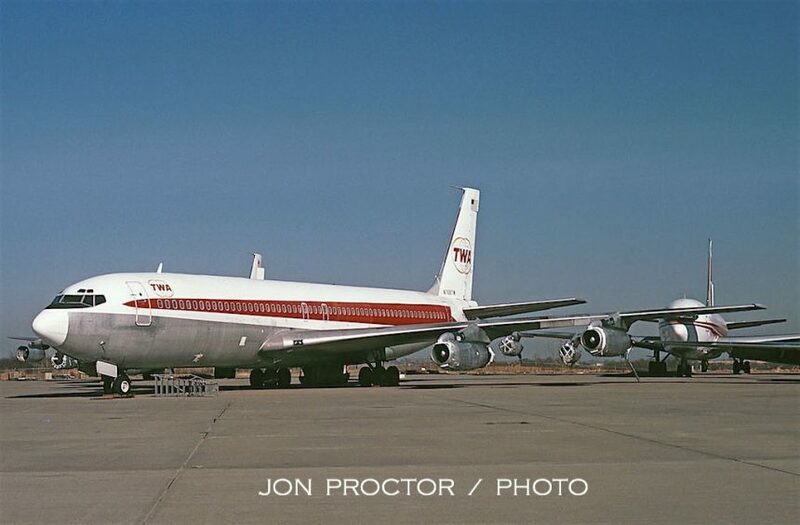 Although airline flights began at MCI in October 1972, I didn’t shoot again there until February 1975, capturing TWA 707-331C Cargojet N5774T, which appears to have just rolled out of the paint shop following a base overhaul. Following delivery three months earlier, L-1011 ” N30124 sits engineless, its engines having replaced others in need of overhaul. 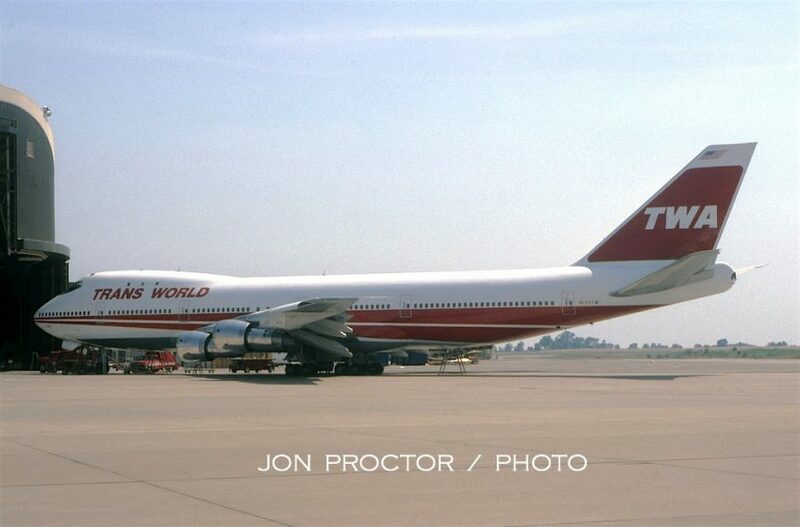 This TriStar, considered surplus until spring, did not enter TWA service until April 30. Company business brought me back to the base fairly often and I snapped pictures when the opportunity arose. 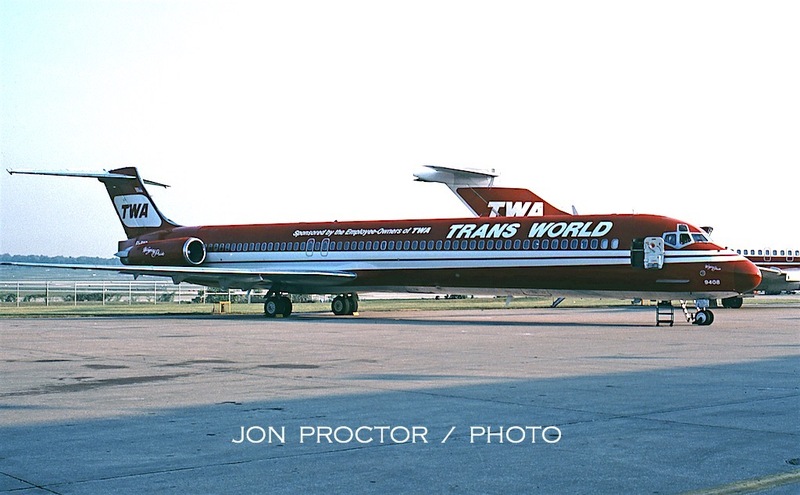 Another freshly painted example, 727-31 N856TW wears the then-new twin-stripe livery with hollow TRANS WORLD titles. 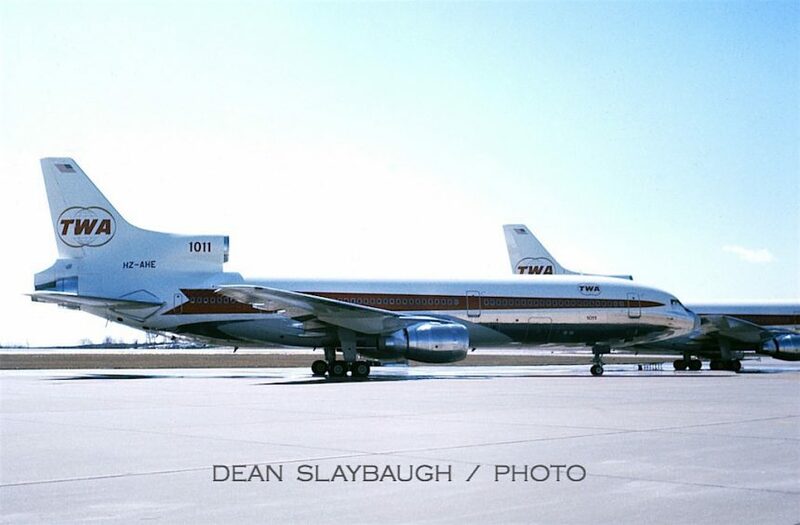 Dean Slaybaugh photographed the last two L-1011s acquired by TWA in the initial batch of 33 airplanes. Both were sold to Saudi Arabian Airlines on acceptance. Here’s HZ-AHE after rolling out of the paint hangar a month later. 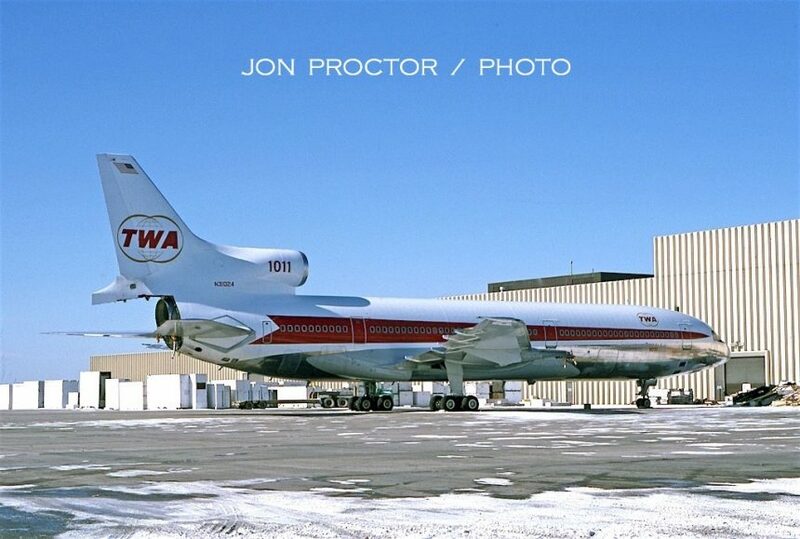 It wore N31032 until change of ownership, with that registration later assigned to another TriStar. 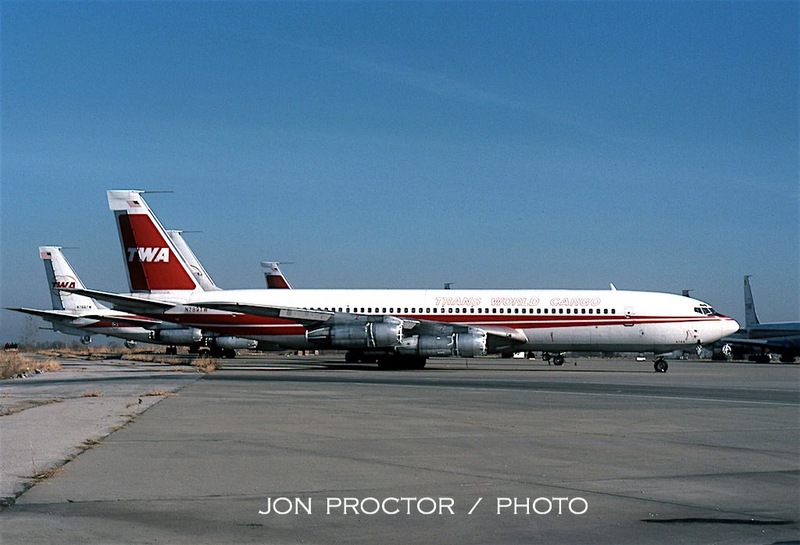 TWA began retiring the 707 freighters and straight-pipe -331s in late 1978. 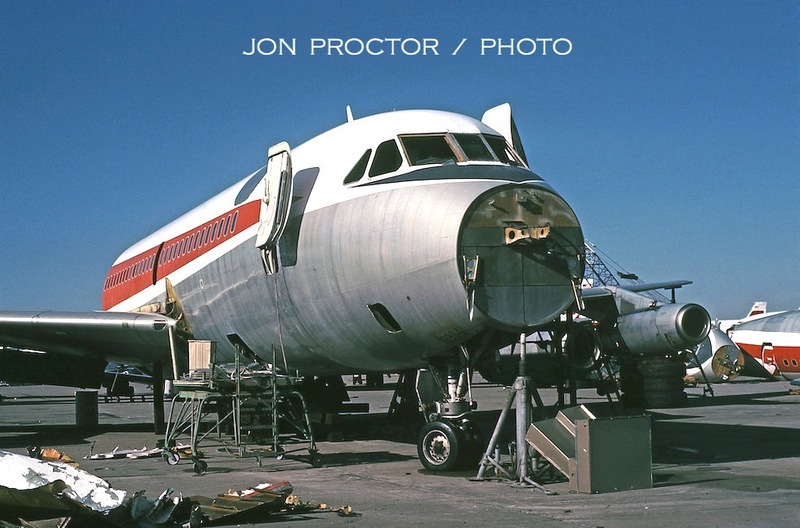 On November 14, 1979, I photographed some of the parked airplanes on the base ramp. 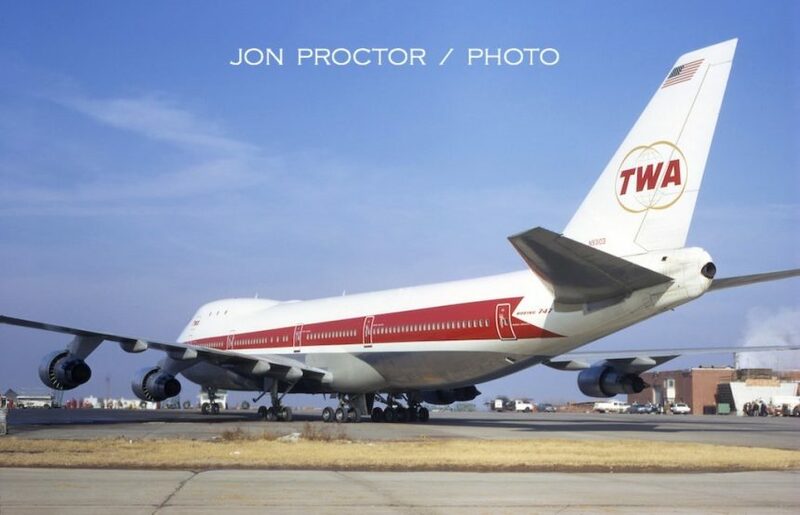 N768TW was scrapped there. 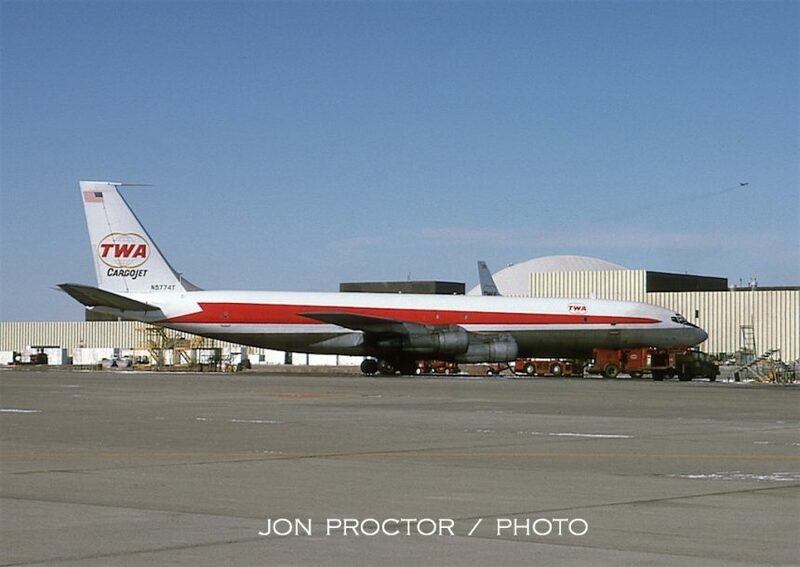 N789TW is one of two 707-373C freighters built for World Airways but instead bought by TWA. 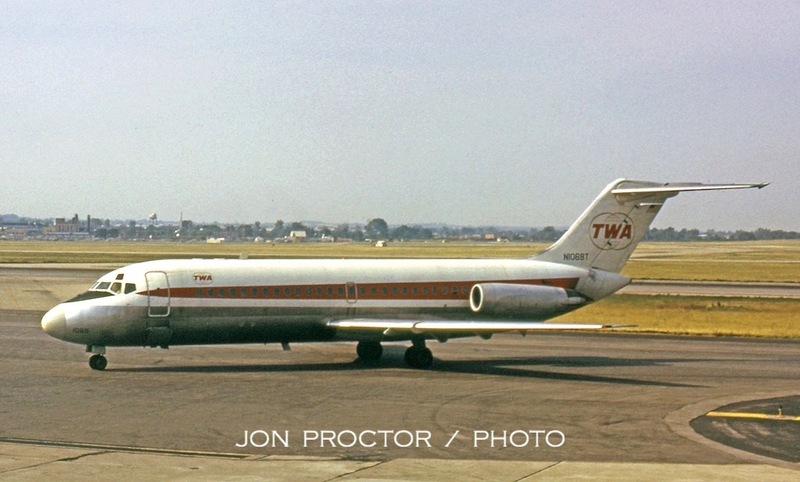 The second airplane, N790TW, was destroyed in a takeoff accident at Tel Aviv in November 1970. 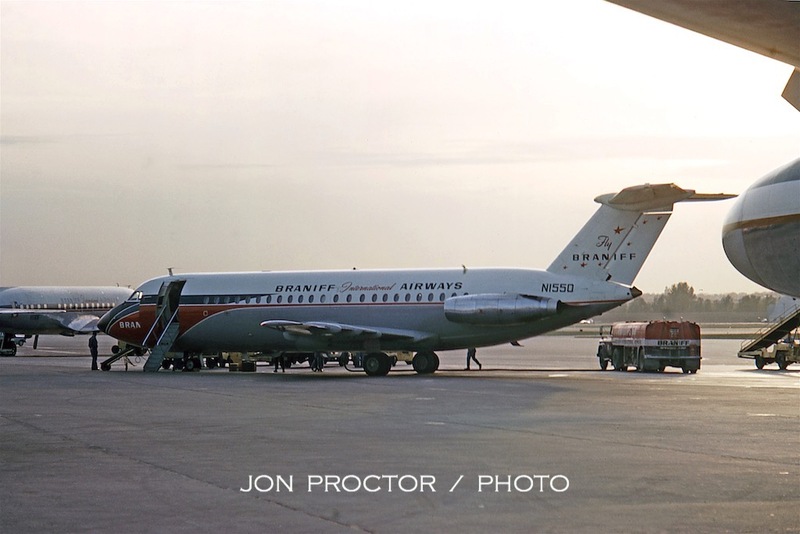 Most of the original DC-9s were withdrawn by this time. 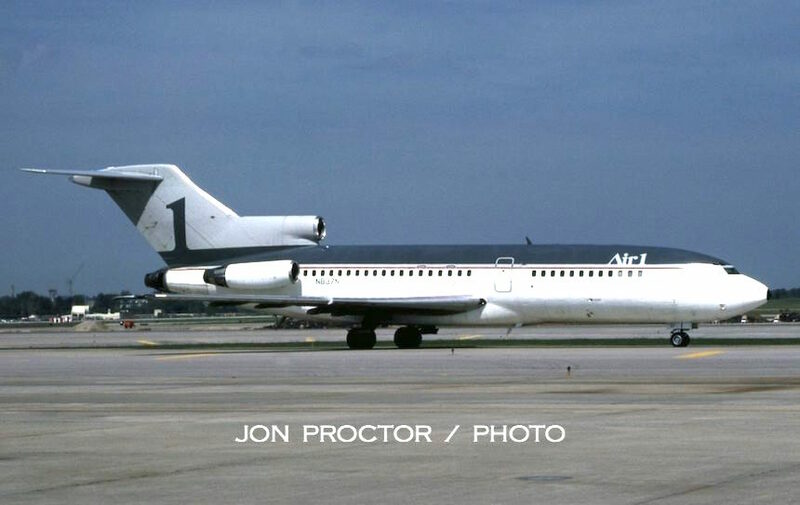 Among the last to leave the fleet was N1058T, right, sold three months later to British Midland Airways, along with N1057T, left. TWA sold 16 Convair 880s to American Jet Industries in February 1978, with options to purchase the final eight, but did not take them. The remaining airframes, including N823TW, were finally scrapped more than four years after being withdrawn from revenue service. N802TW has been stripped of parts and awaits the cutter’s torch. Further along, N804TW has lost its tail. TWA began acquiring second-hand jumbos in 1980. 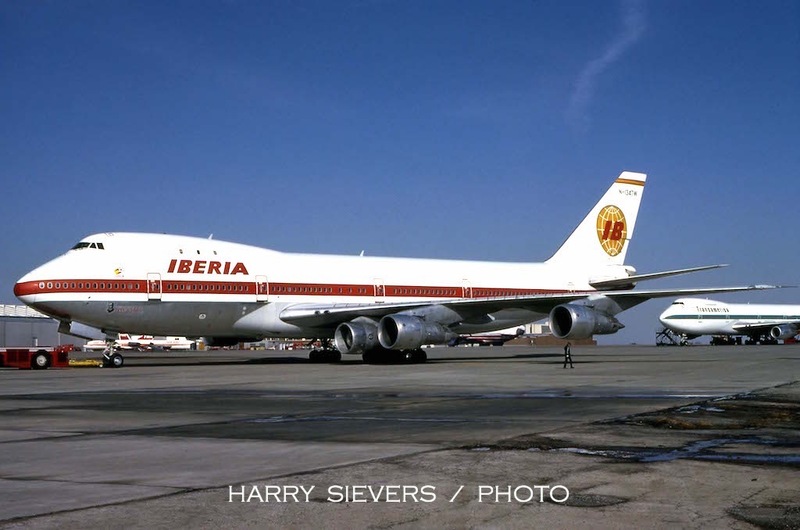 The first was N133TW, the former Iberia 747-156 EC-BRO. I photographed it, fresh out of paint, on June 21. Seen the same day, 707-331C N786TW awaits sale unpainted. Two years later it joined Florida West. Harry Sievers caught the second 747-156 from Iberia, EC-BRP, with U.S. reg N134TW on the tail, as it arrived from Madrid in March 1981, complete with a spare engine that was probably part of the purchase deal. Both EC-BRO and -BRP were broken up in Arizona in the late 1990s. Another of my collection images, this seems the appropriate opener for St. Louis. 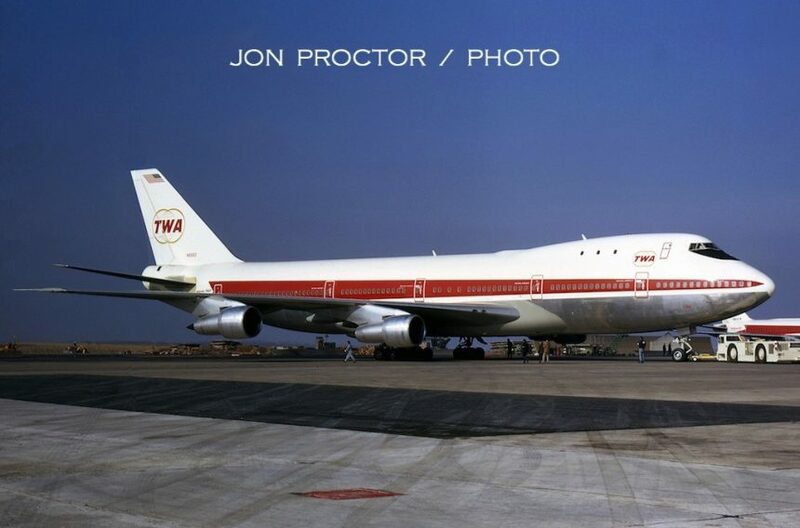 Boeing 747-131 N93113, 80th off the assembly line, was taken during an open house at Lambert International Airport (STL) on October 25, 1970, just three days after delivery to TWA. It was parked in front of the company hangar and drew huge crowds. Look closely: Lacking Jetways or even a set of steps able to reach the passenger doors, a fork lift was used to “bridge” the last few feet. Unfortunately the slide mount did not reveal a photographer name. In any event, the image is truly stunning, don’t you think? 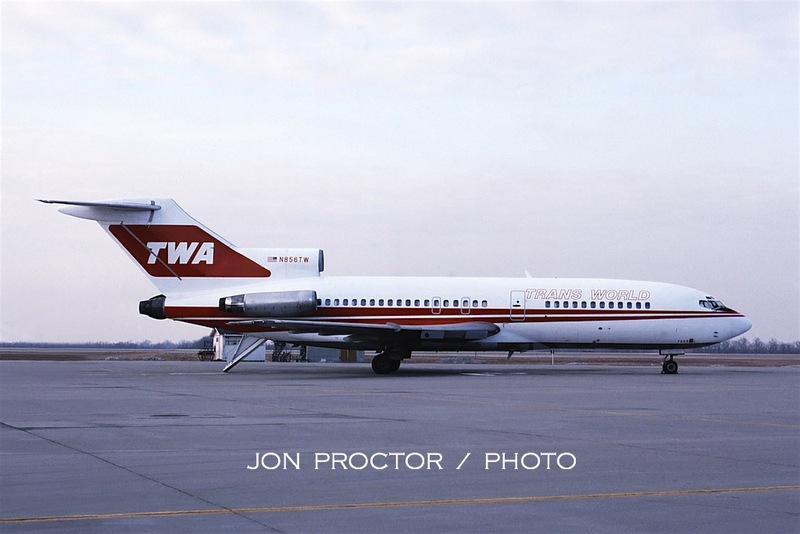 I visited STL just a week earlier and photographed 727-31C N893TW. 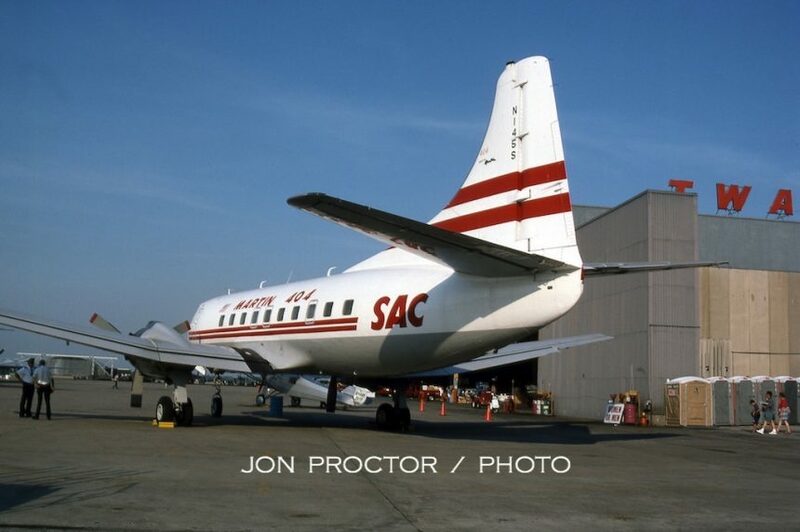 One of eight quick-change Boeing tri-jets, its versatility was less than successful for TWA, resulting in reconfiguration to a permanent passenger configuration at the end of 1970, with the main-deck cargo door sealed. The entire -QC fleet was sold to UPS in 1982. Here’s a good example of shooting pictures in mid-day sun! 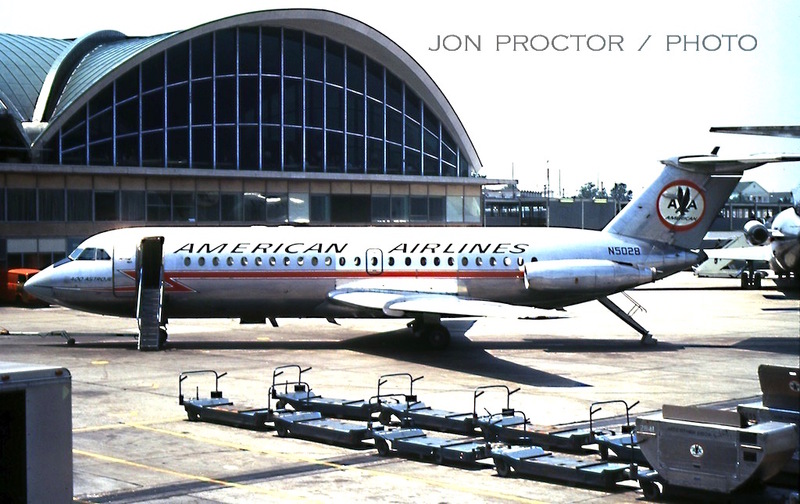 American Airlines BAC 1-11 N5028 sits at the gate, reflecting unique metal used at the mid-section of the fuselage. 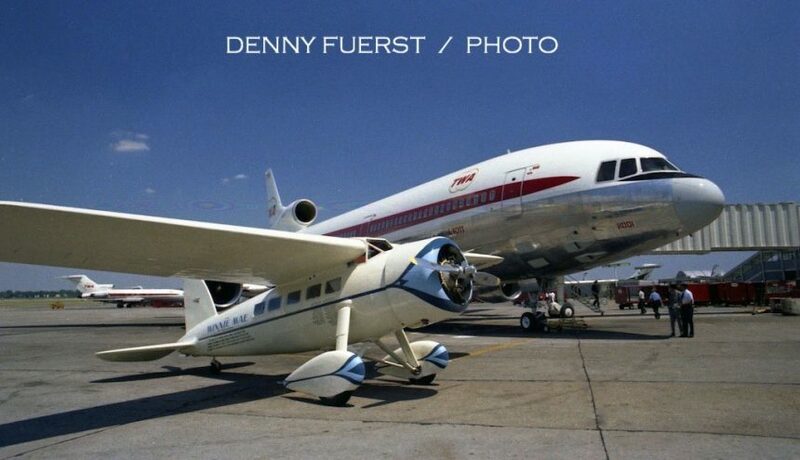 Once the initial luster of the full airplane began to fade, it stood out even more. Sister ship N5035 is pushed back from the same gate a month later. 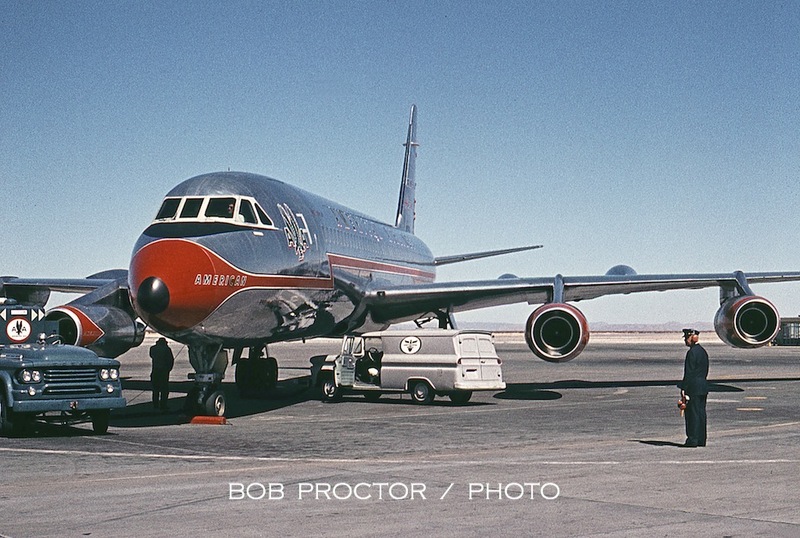 Placed into service with American beginning in early 1966, the 30-strong 111 fleet was short-lived at the carrier, with the last withdrawn by November 1971, in favor of additional Boeing 727s. 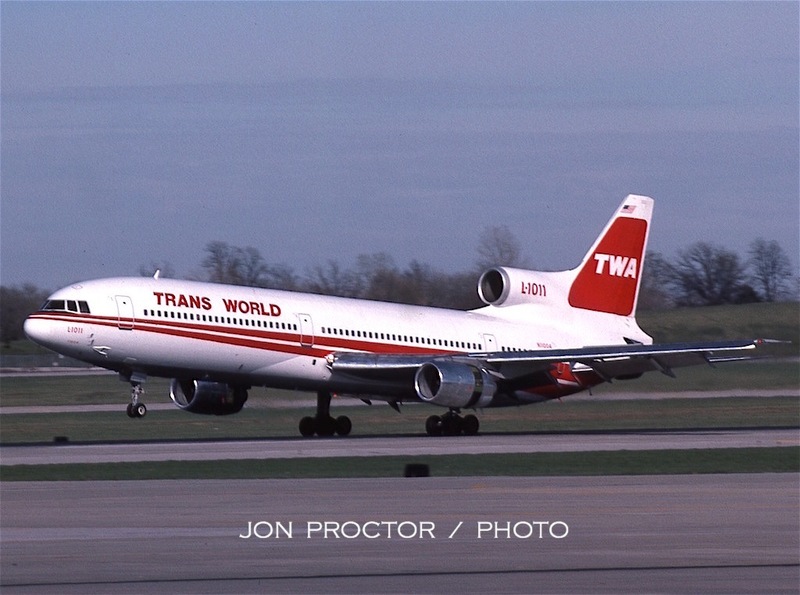 TWA began Lockheed L-1011 service on June 25, 1972, between St Louis and Los Angeles. N31001, the only TriStar in the fleet at that moment, taxis to the airport’s first Jetway-equipped gate for its inaugural flight to California. 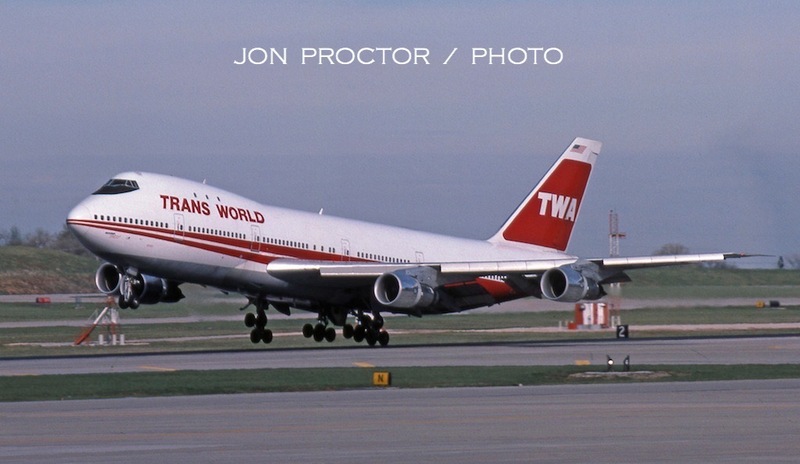 For more on the subject, see my TWA’s TriStars story. A replica of the famed Lockheed Vega, Winnie Mae, was parked on the ramp as part of the festivities. TWA predecessor Maddux Air Lines operated Vegas from 1928 until its merger with TAT two years later. Thanks to TWAer Denny Fuerst for this image. As a Director of Customer Service (DCS), I worked the inaugural L-1011 and stayed with it for three days. 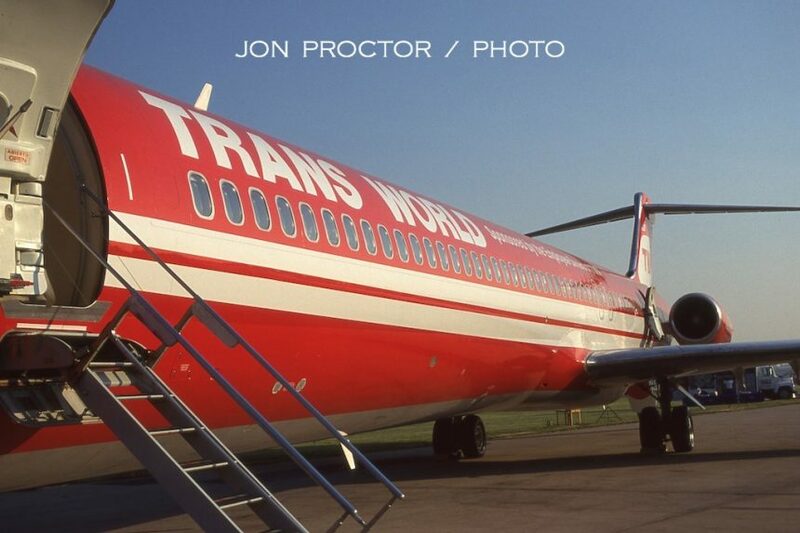 Passing through STL again on June 26, I caught TWA DC-9-15 N1069T taxiing in as we pushed back from the gate. 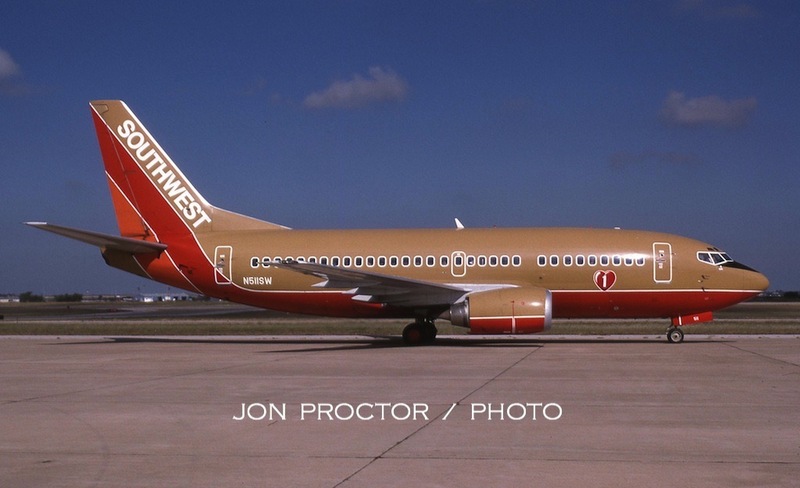 We jump all the way to December 1980 for my next STL picture, of freshly painted Midway Airlines DC-9-15 N1065T, one of three acquired from TWA only two months earlier. 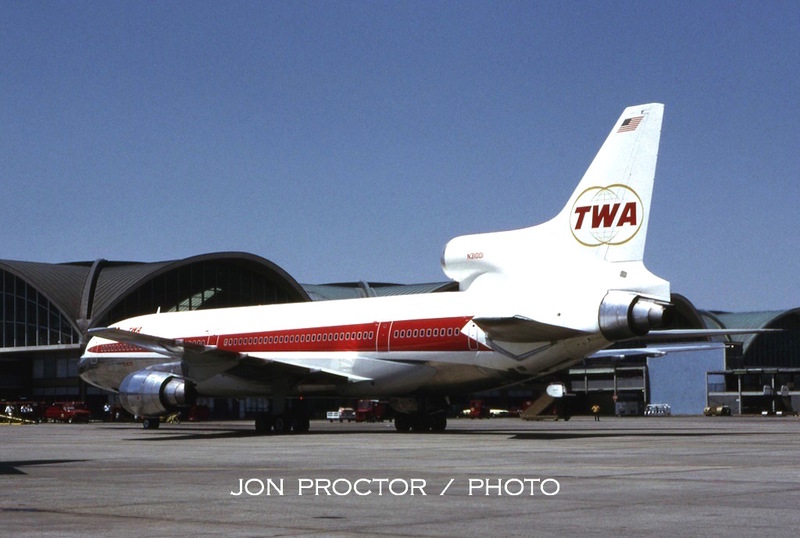 Six more former TWA Nines, sold to McDonnell Douglas, also found their way to Midway on lease. 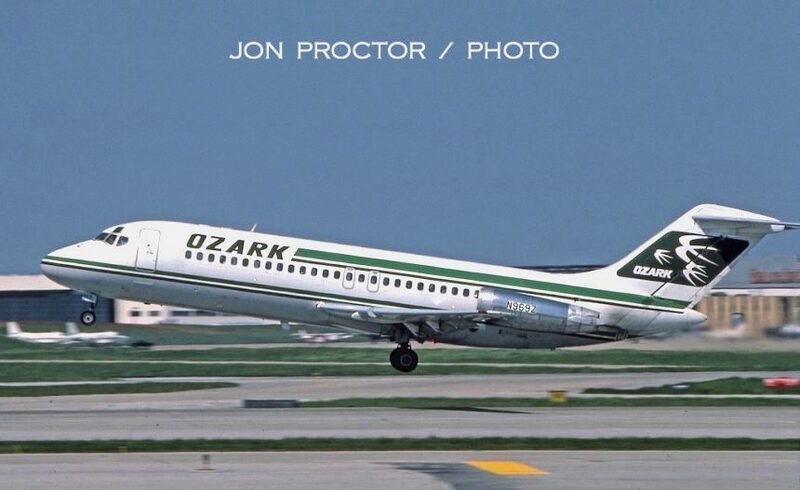 In the mid-1980s as a flight attendant, I endured numerous “practice layovers” at STL, spending multiple hours at the airport between flights. Rather than sitting around in crew lounges or the employee cafeteria, I took pictures. The low sun made for this nice study of TWA 727-231 N54232 pushing back from its gate, on July 17, 1984. 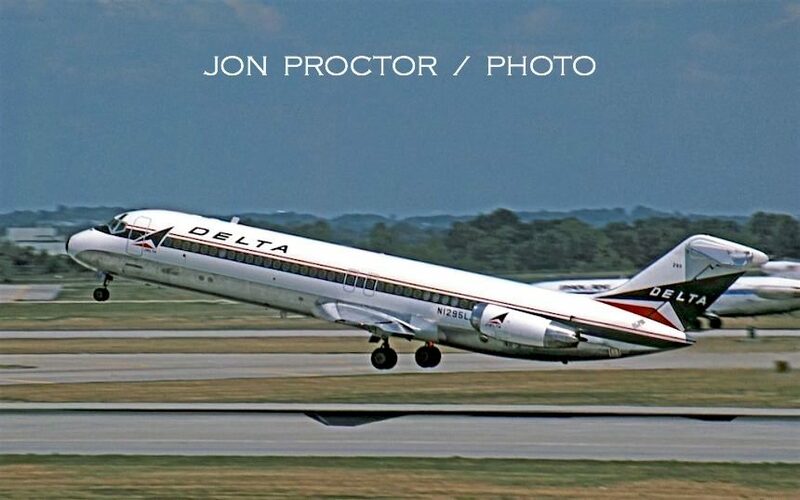 Delta operated most of its STL flights with DC-9-32s during this time period. N1295L, seen lifting off on a mid-day departure, spent its entire working life with Delta and was finally retired in early 1992. Northwest operated military charters to and from STL. Boeing 747-251B N627US touches down on September 12, 1984. Here are three images taken on December 7, 1983, all in glorious winter sun. 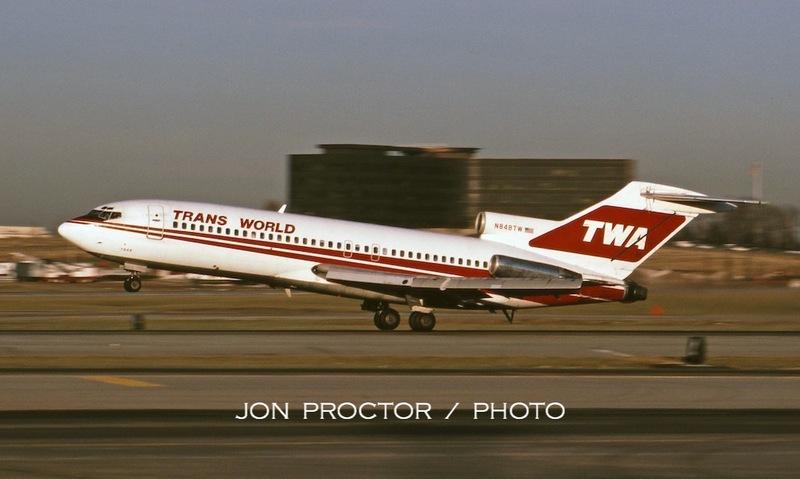 Already 20 years old, TWA 727-31 N848TW soldiered on another decade and was finally broken up at Kansas City on January 26, 2000; it had the distinction of operating the company’s last revenue 727-100 flight. 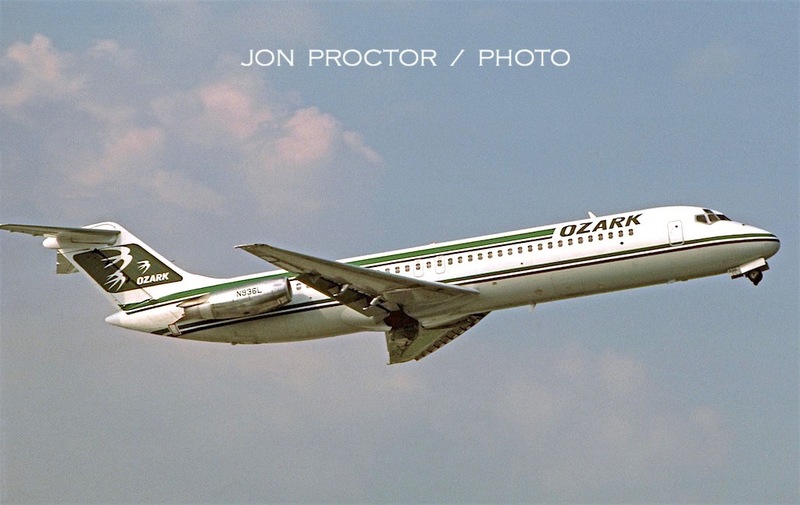 DC-9-41 N933L came to Ozark in 1982, second-hand from Japan’s TDA – Toa Domestic Airline. 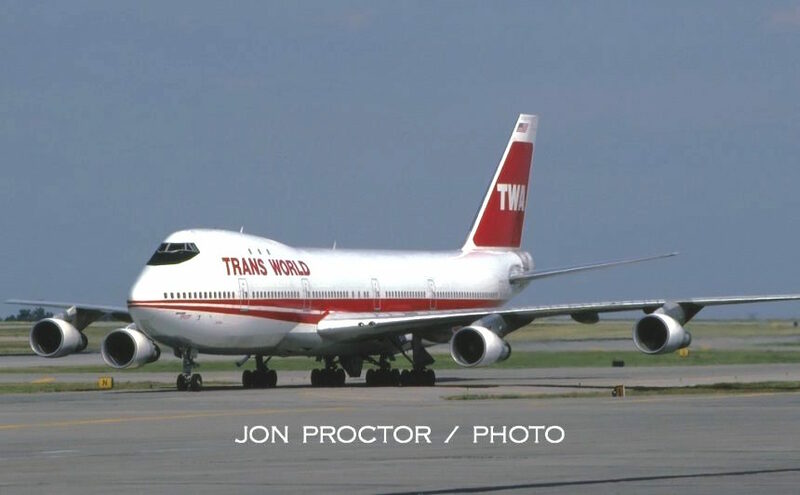 IT was acquired by TWA in 1986 when OZ and TW merged. 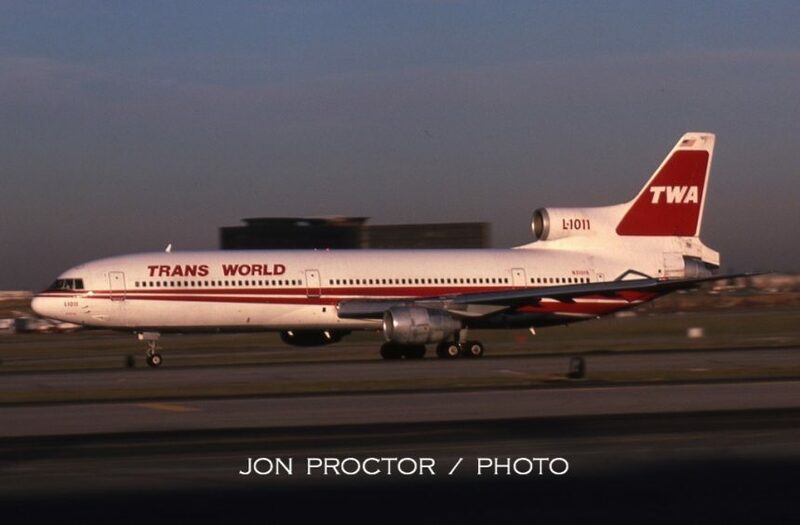 I was running out of daylight when TWA L-1011 N31019 caught my lens. This airplane is now property of the National Airline History Museum in Kansas City. Seen April 12, 1985, DC-9-31 N982PS also came to Ozark second-hand, this time from Pacific Southwest Airlines – PSA. Less than two years old when acquired, its original registration was retained. 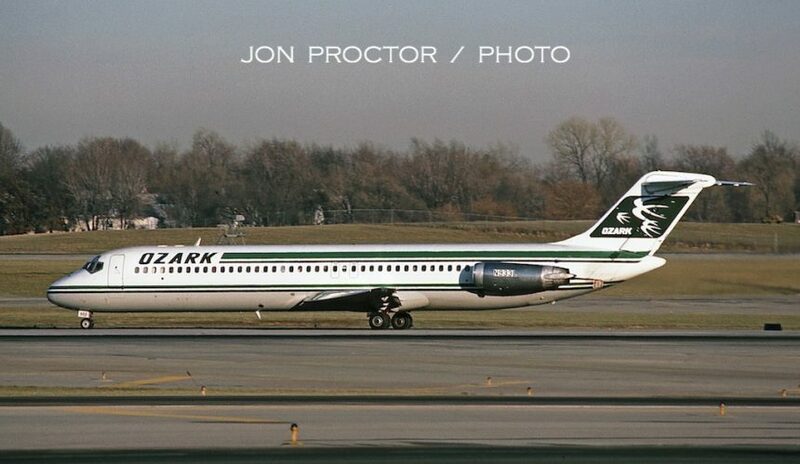 While Ozark bought two DC-9-34 models new from the manufacturer, N936L first flew for Swiss carrier Balair. With landing gear rotating, she climbs out smartly on April 12, 1985. 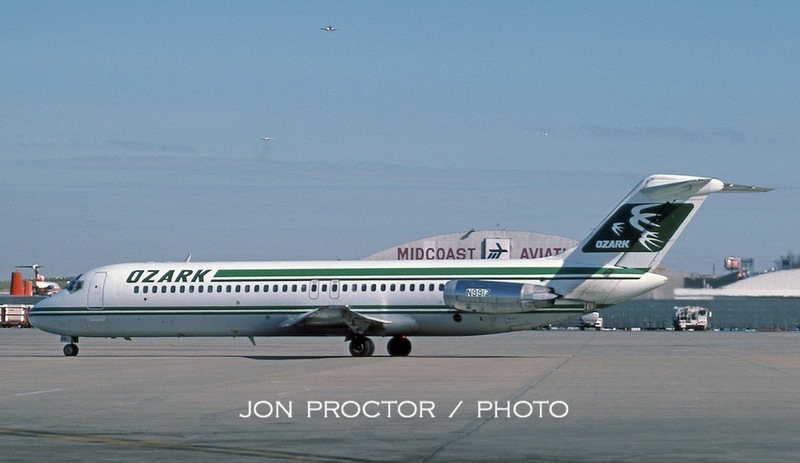 Also in April I caught DC-9-31 N991Z, one of nine with Ozark that originally flew for Northeast Airlines; this one as N978NE. I managed to capture these two TWA landing shots from the STL ramp, both with medium telephoto lenses. During its life, Boeing 747-131 N93117 racked up more than 90,000 hours in the air and was retired in December 1997. Right behind the Boeing jumbo, L-1011 N11004 rolls out with thrust reversers deployed as its nose settles to the runway. 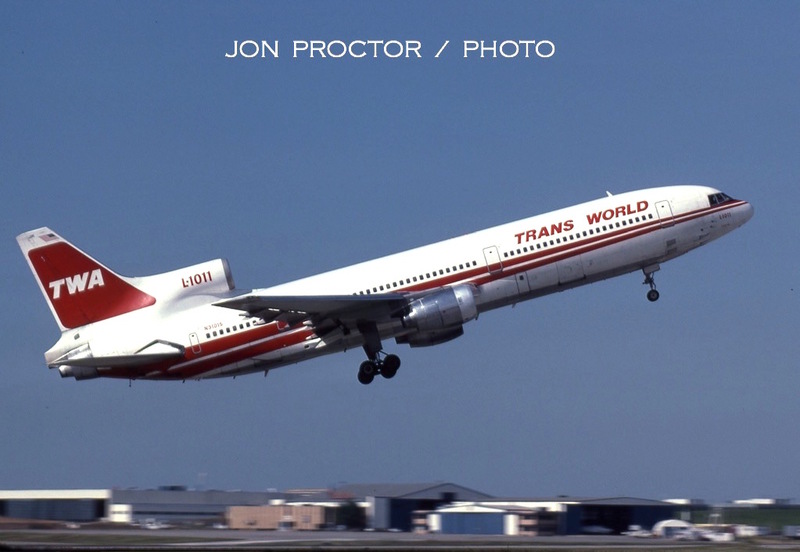 This was one of three TriStars retired on September 3, 1997, the last day of service for the type with TWA, having completed 65,689 hours and 25,562 landings. N11004 was ferried the same day to Kingman, Arizona, and broken up there five years later. 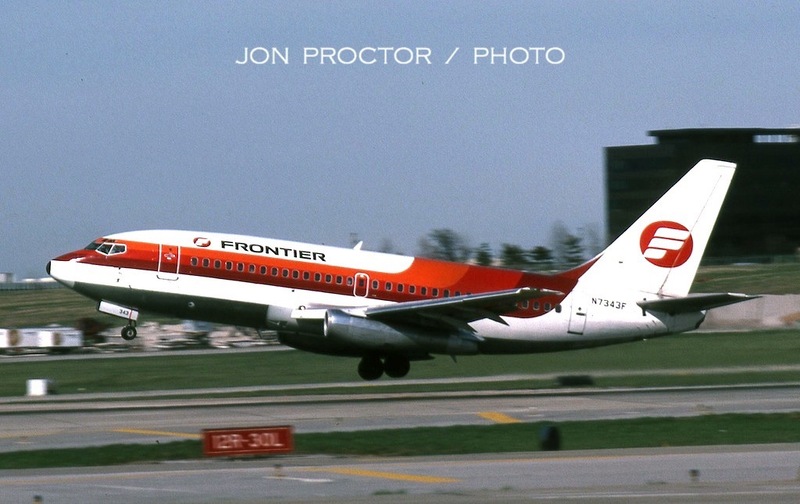 Headed to Denver, Frontier 737-291 N7343F lifts off in April 1985. 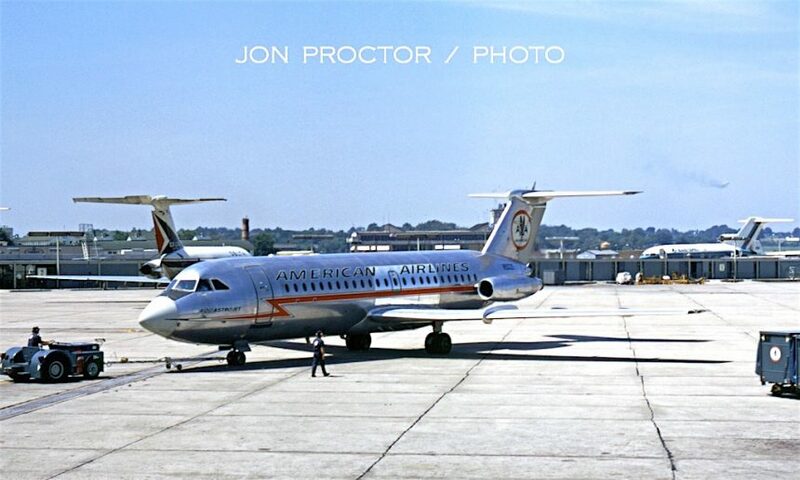 That same day I caught DC-9-15 N969Z as it broke ground. 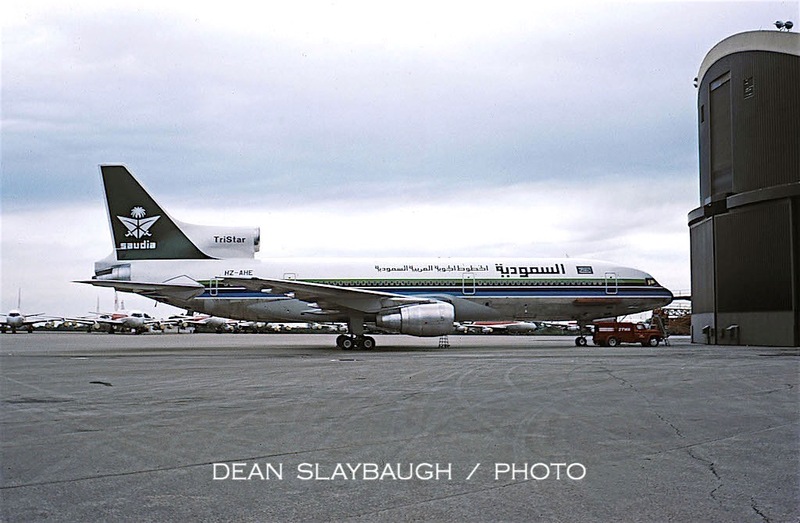 The twin-jet was acquired from Saudia – Saudi Arabian Airlines in 1972. 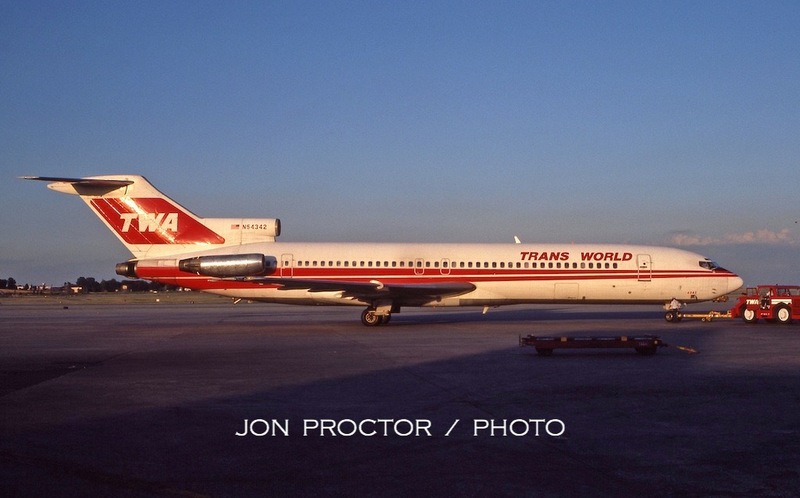 Originally HZ-AEB, it flew for Ozark 14 years before joining TWA following the 1986 merger. I believe it was the only Ozark short Nine with two emergency exits on each side. From the shortest to the longest. The pictured DC-9-82 N951U and sister ship N950U were acquired in December 1984. Two more joined the fleet a year later but the last four on order were not taken up. 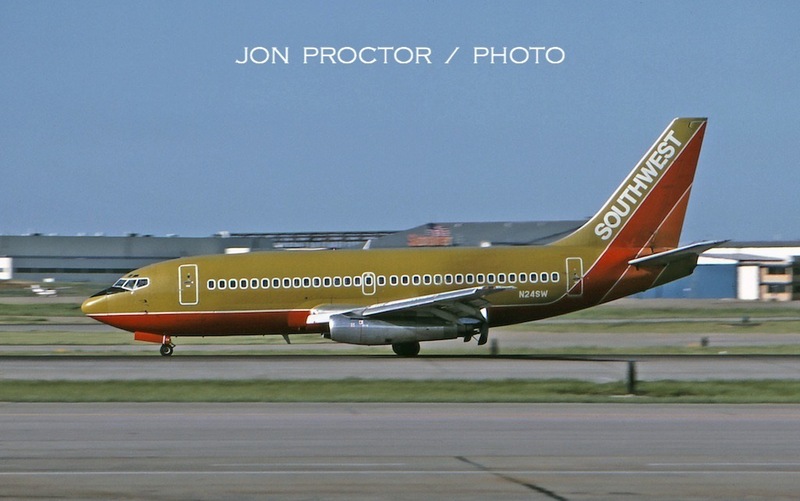 Still photographed in May 1985, here are two Southwest 737-2H4 variants showing contrasting colors. N24SW reflects the olive green paint over red and orange. N28SW appears with the more attractive tan color that survived until replaced by Southwest’s Canyon Blue in 2001. The last 737-200s were retired in January 2005. 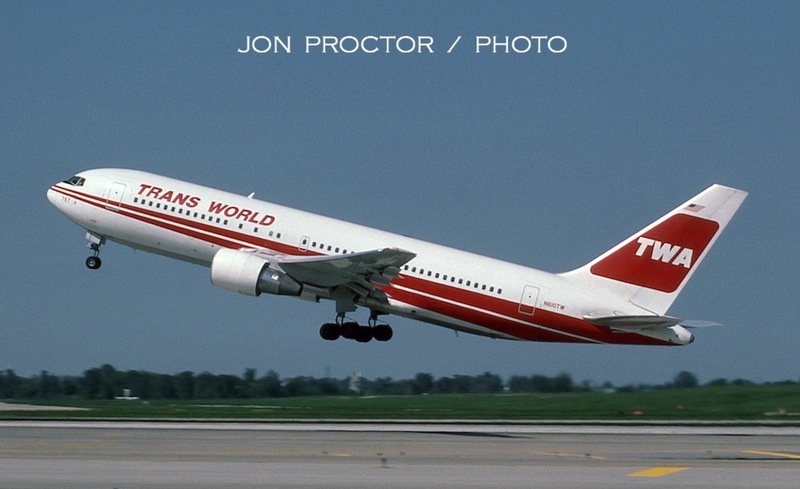 TWA 767-231s were frequent STL visitors. Last of the original 10-order batch, N610TW departs. 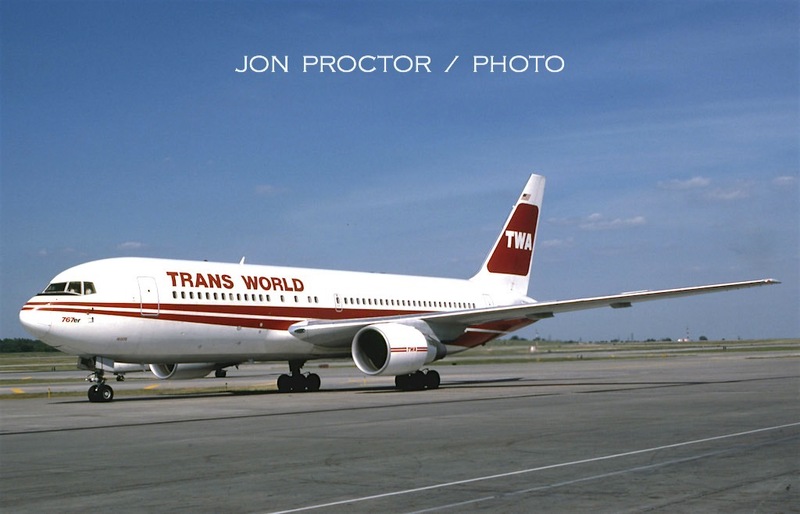 When TWA began trans-Atlantic 767 operations in 1985, 767er markings appeared on the nose upon completion of overseas modifications. 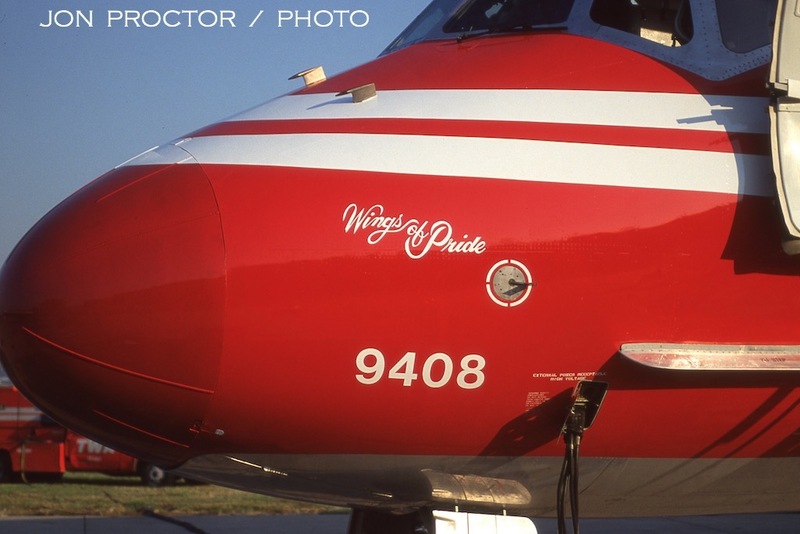 I always though it read like: “Sevensixtysevener!” In addition, twin stripes surrounding ‘TWA” were added to the engine nacelles, reminiscent of the Super-G Constellation wingtip tanks. N605TW displays the changes as it taxis to the gate. Another military contract carrier, Transamerica acquired ex-Lufthansa 747-130 N780T, which dropped by STL on July 11. Another subtle livery enhancement is seen on 747-156 N134TW, seen earlier on this page wearing its original Iberia colors. 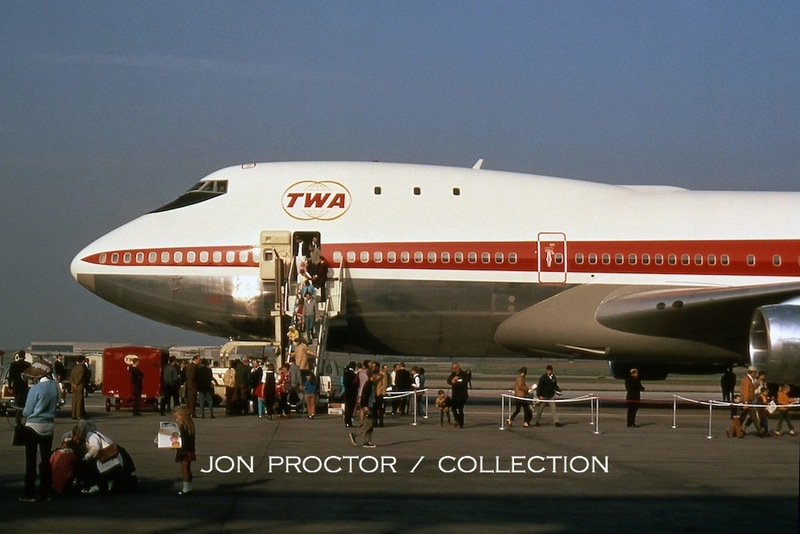 Engine nacelles were changed from bare metal to white, and the inscription Skyliner 747 was added to the nose, signifying addition of enlarged overhead bins in the cabin. Judging by the climbout angle, I’d guess L-1011 N31015 had a light payload or wasn’t going far. 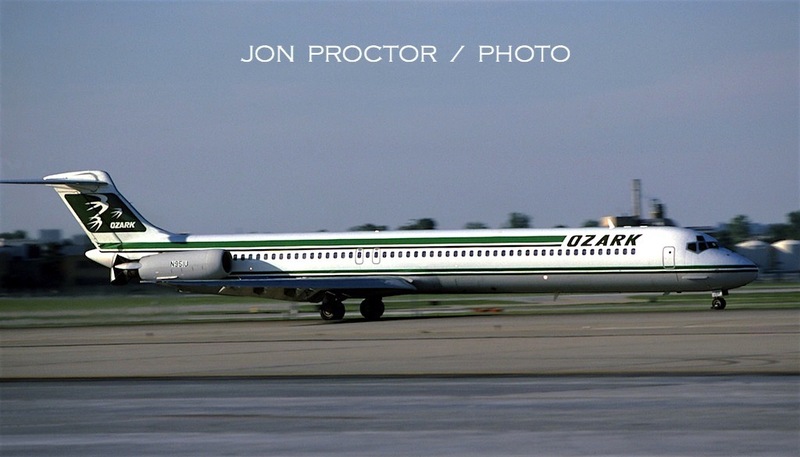 Most of Ozark’s DC-9 fleet wore interim colors following the TWA merger, but DC-9-32 N931L was in full company colors when I photographed her on April 24, 1987, although she already needed a wash aft of the engines. 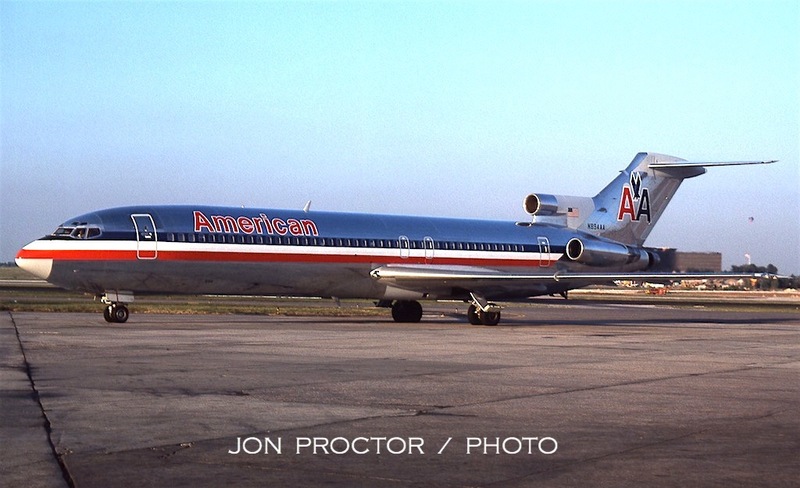 Jumping to October 1990, American 727-223 N894AA poses in the morning sun. That spot behind it is actually a hot-air balloon. 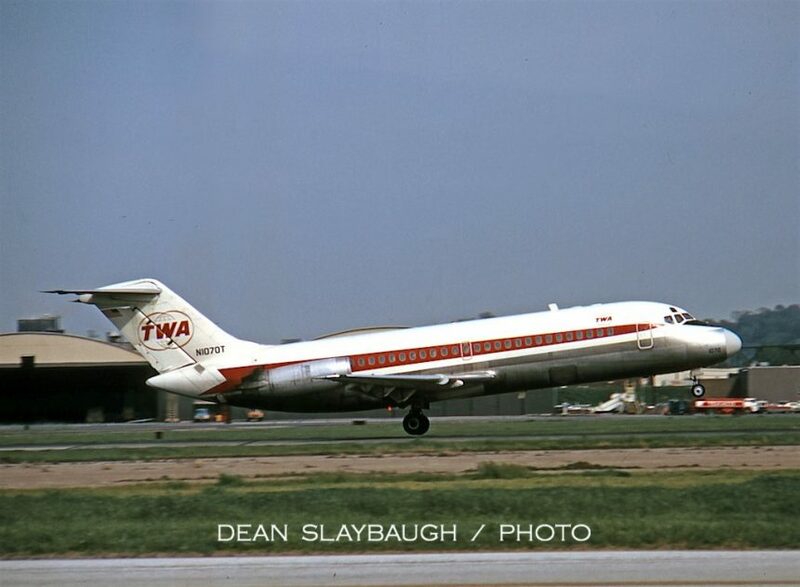 I attended a TWA open house at STL on September 10, 1994. 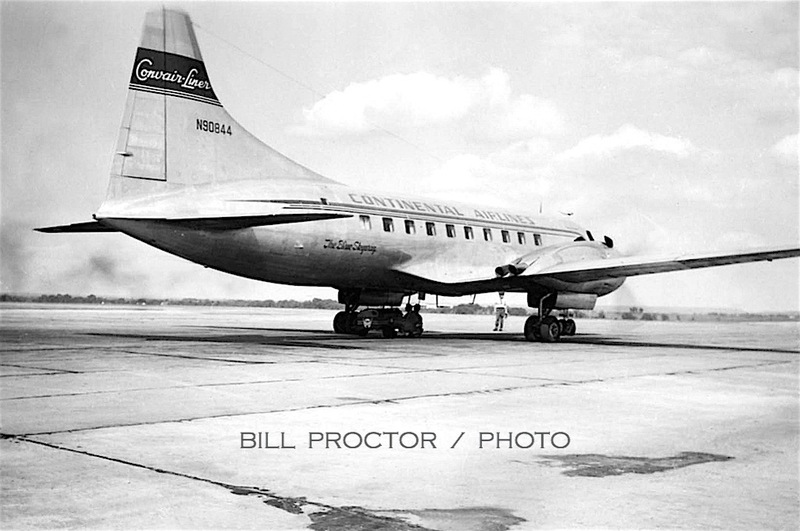 Among the unique airliners on display was the Save-A-Connie 1049H Constellation, N6937C, cleverly disguised as a Super-G, although the forward and aft cargo doors gives it away. 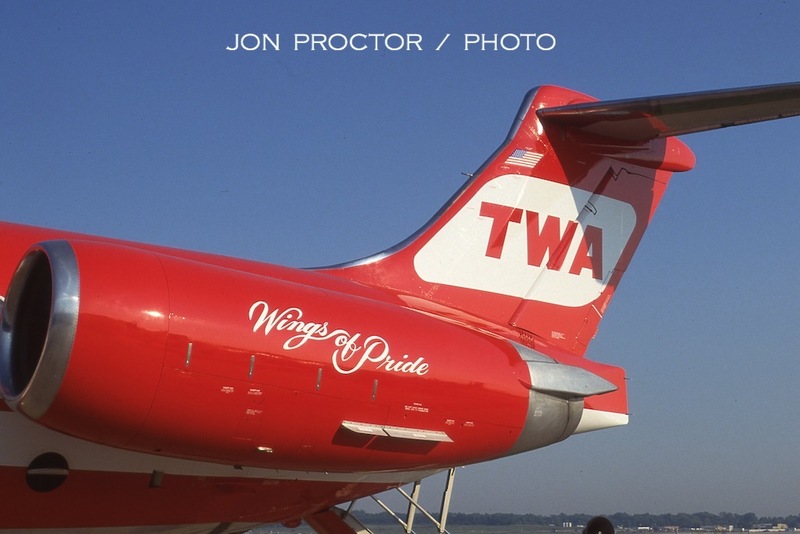 Meticulously restored and maintained, it flew on the airshow circuit during summer months and later wore full TWA titles. The Connie is owned by the Airline History Museum and kept in its hangar at the Charles B Wheeler Downtown Airport (MKC), Kansas City. The Connie’s graceful lines make it one of the most beautiful airliners ever built. 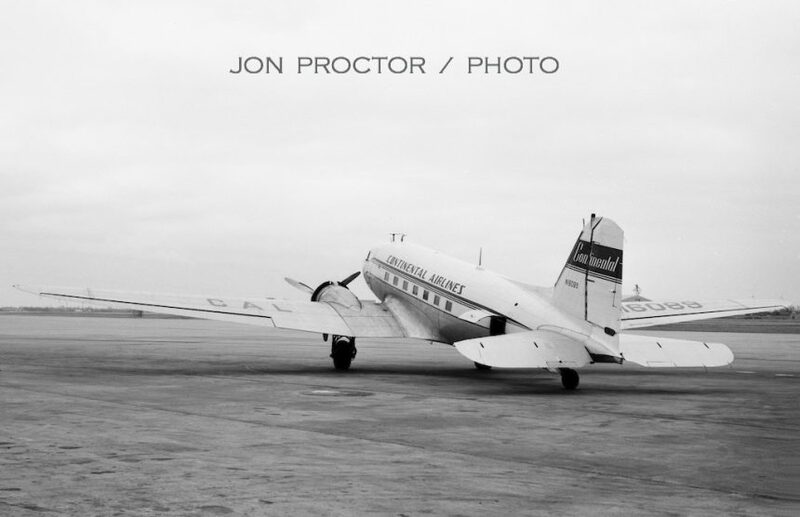 This Douglas DC-2, appropriately registered N1934D to match the year the type entered service, was flown in from its Long Beach, California base and placed on display. Owned at the time by the Douglas Historical Foundation, it has since been placed on permanent display in the new Aviation Pavilion at the Museum of Flight in Seattle, resplendent in full TWA colors, even though it was an original Pan Am delivery airplane. TWA references were added specially for the show appearance. I was fortunate to ride on the “Dizzy-2” on its return trip to Long Beach via Amarillo, Albuquerque and Mesa, Arizona. That’s another story I’ve got to post one of these days. 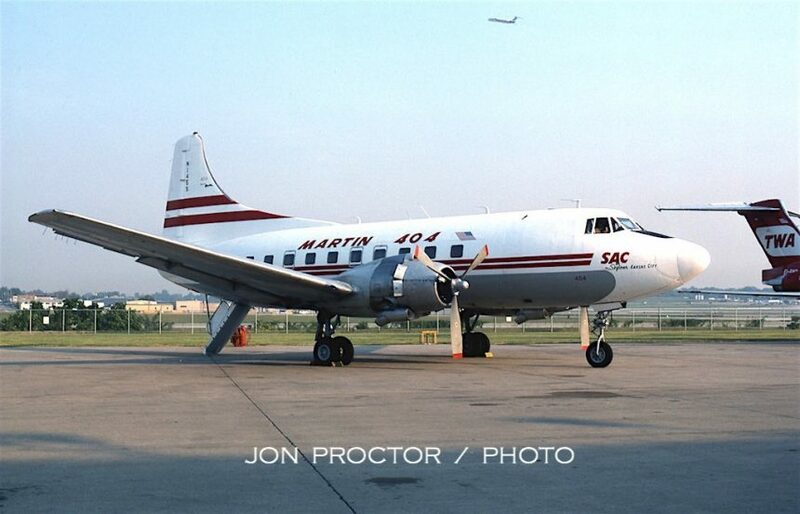 Another Save-A-Connie airplane, Martin 404 N145S appears in basic TWA colors, named Skyliner Kansas City. 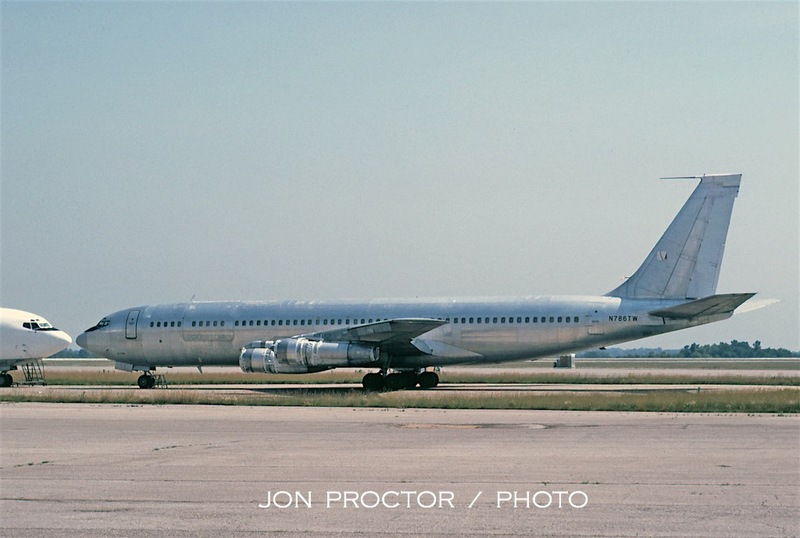 It too resides with the Airline History Museum today and like the Connie, is available for walk-through visits. 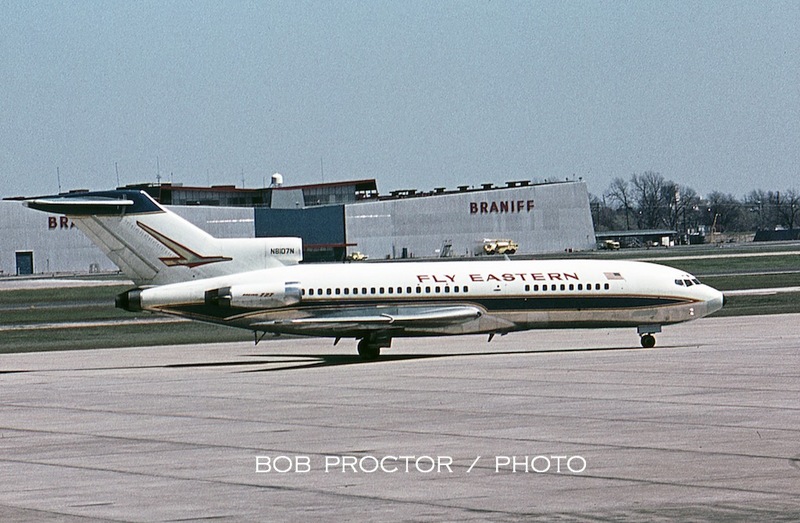 N145S is an Eastern Air Lines original, first registered N451A. 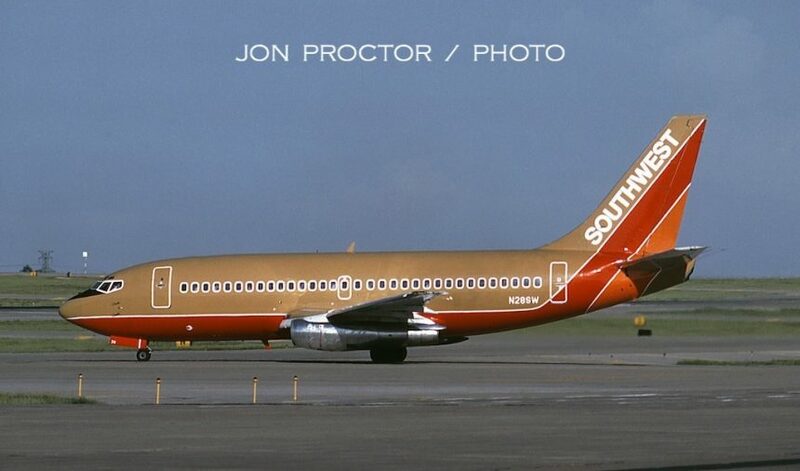 It also served with Southern Airways and Systems International. 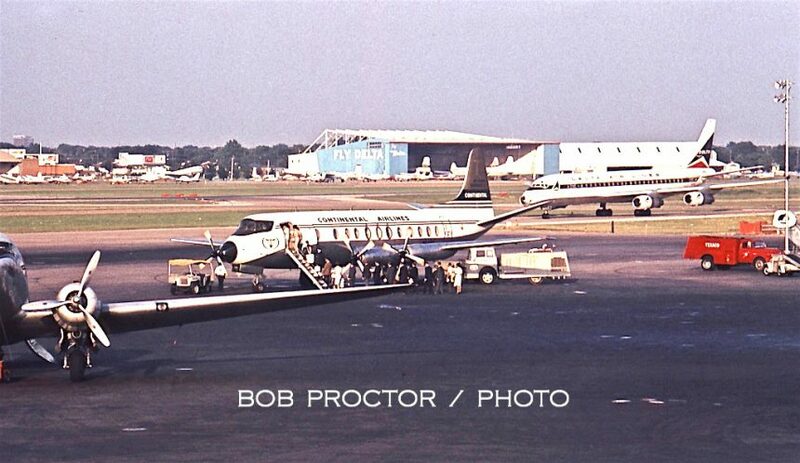 Thankfully the Martinliner was preserved. 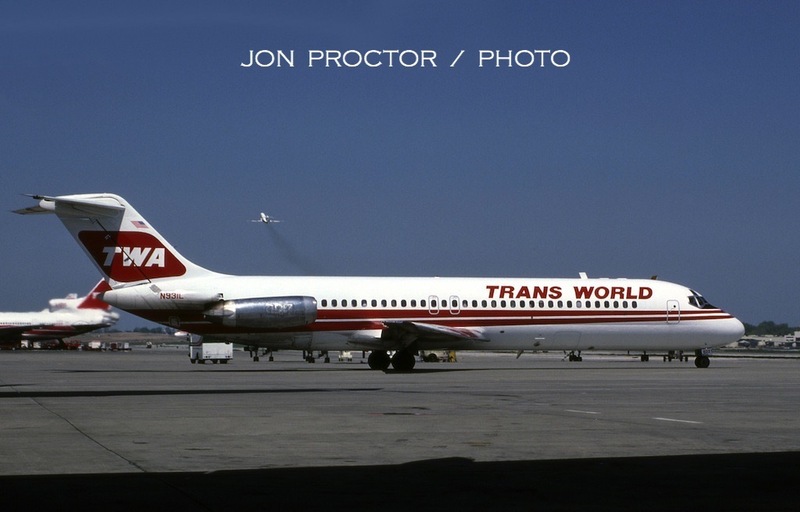 DC-9-83 EI-BWD was leased by TWA, hence the Irish registration, and sponsored by the employees, who contributed towards its $233,000 monthly lease payments. 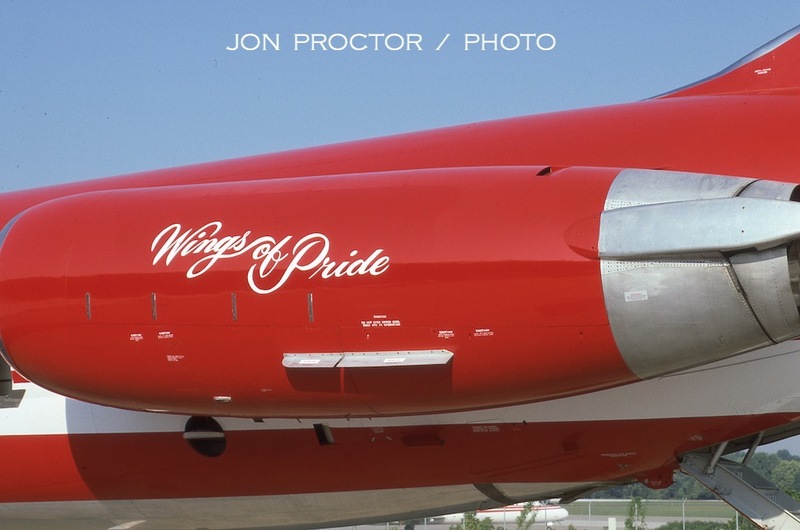 To recognize this effort, the airplane was painted in reverse colors and flown to STL for the open house. I had to get to the airport early in order to snap a few uncluttered pictures. 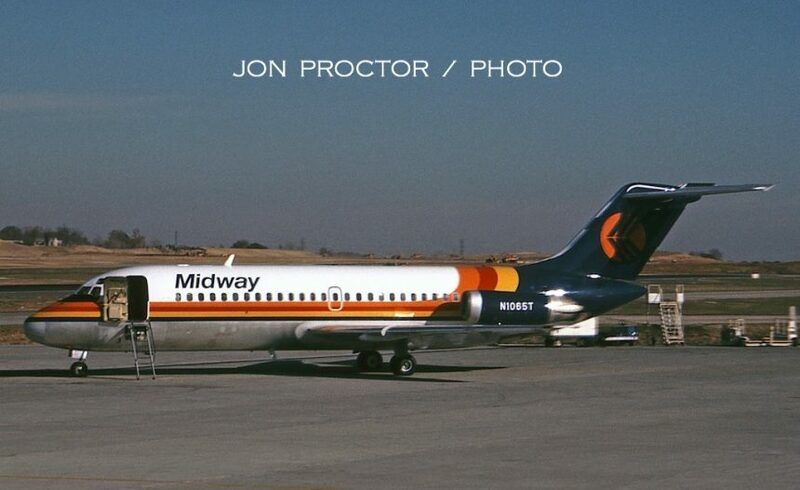 This is my only photo in the state of Oklahome, taken September 28, 1979 at Will Rogers Airport, Oklahoma City. Up bright an early for a dawn patrol flight, I caught 727-231 N74317 a the departure gate in the morning sky. Looks as though she just got a new paint job. On to Tulsa, here are two of Brother Bill’s images, all circa 1950. 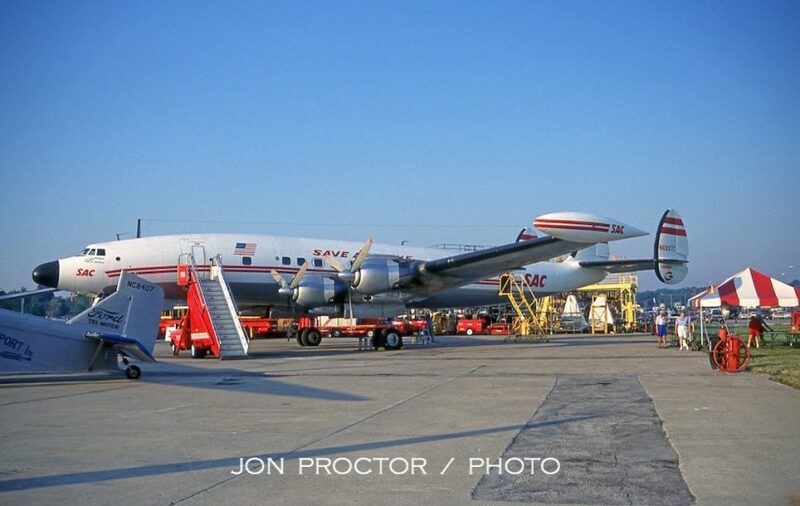 Scanned from small prints, each was labeled “TUL.” First, Continental Convair 240 N90844 fires up with exhaust smoke coming from its No. 1 engine. Delivered new in July 1948, it migrated to Canadian Pacific less than four years later, as CF-CUU. Minneapolis-based Mid-Continent Airlines began flying in May 1936 as Hanford Airlines, with Ford Tri-Motors and Lockheed Vegas. 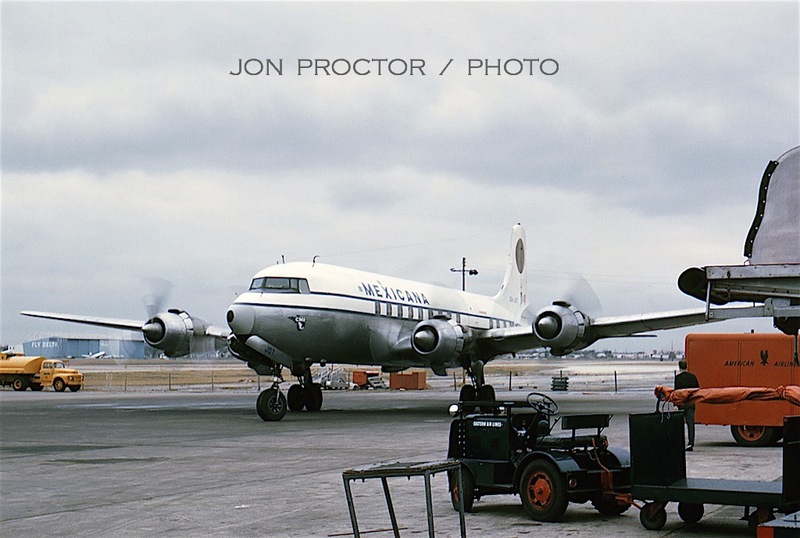 By 1950, its fleet consisted of DC-3s and four ex-Pan Am Convair 240s, including the pictured N90664. 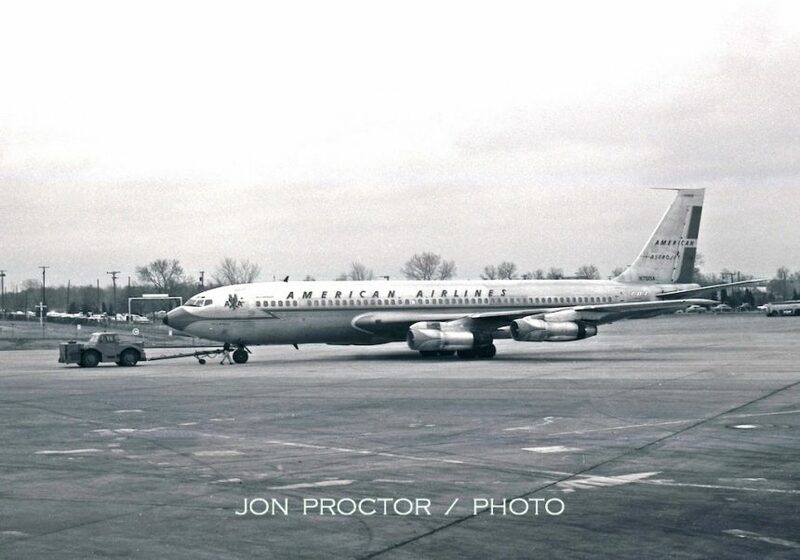 Less than a year after this picture was taken, it crashed on takeoff from Tulsa following engine trouble. Miraculously there were no fatalities among the 34 aboard. 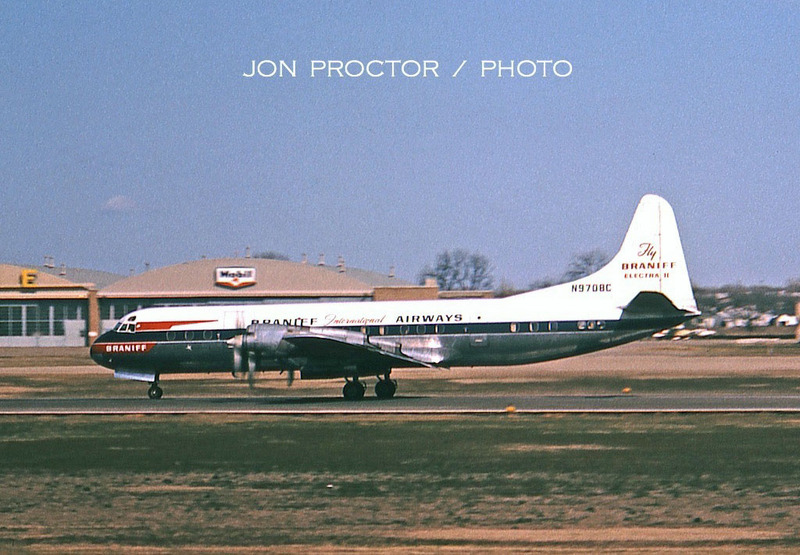 Mid-Continent merged with Braniff Airways in 1952. 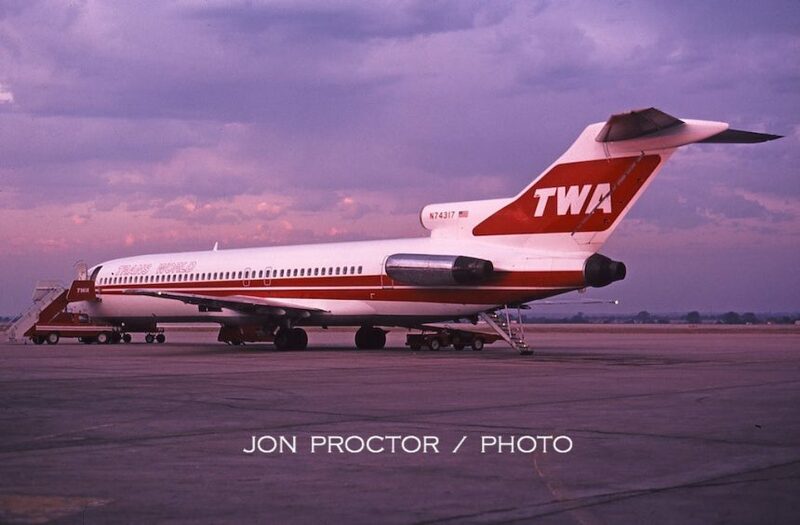 On September 21, 1968, I hopped TWA Flight 158 – a Convair 880 – from LAX to Amarillo via Albuquerque, and rode back to California with brother Bill on his 727 trip. 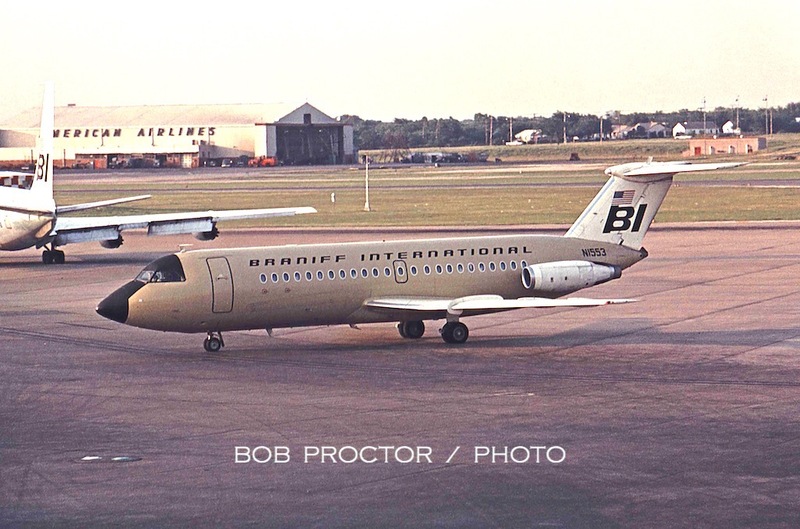 While waiting in Texas, I caught Braniff BAC 1-11 N1541 as it pulled out of the gate wearing one of many pastel liveries of the day. 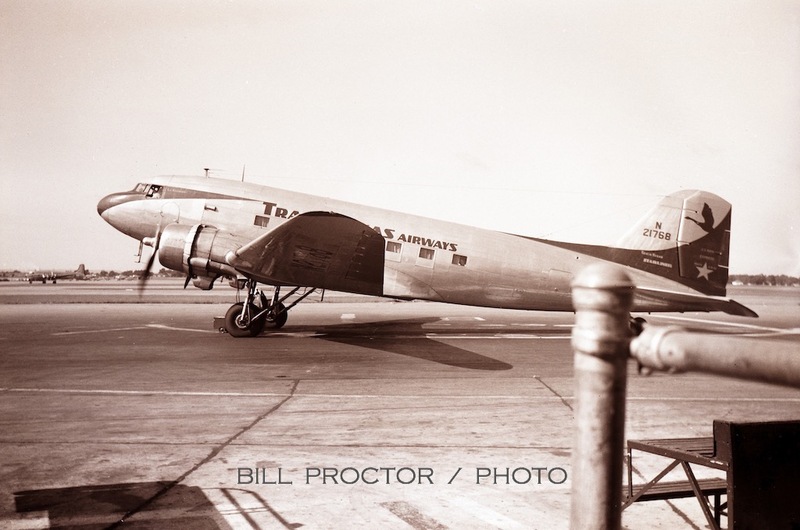 I’ve never taken any pictures at El Paso, but had to add this gem from my collection, of American Airlines DC-4 NC90413, Flagship Cleveland, seen receiving attention during a station stop in 1947. Note the unusual use of a forward right-hand door for passenger boarding and deplaning. American had a propensity for right-hand doors from early on, including its DC-2s and -3s plus the Convair 240s. When its military C-54s, including this example, were “civilianized,” larger entry doors replaced smaller crew hatches. 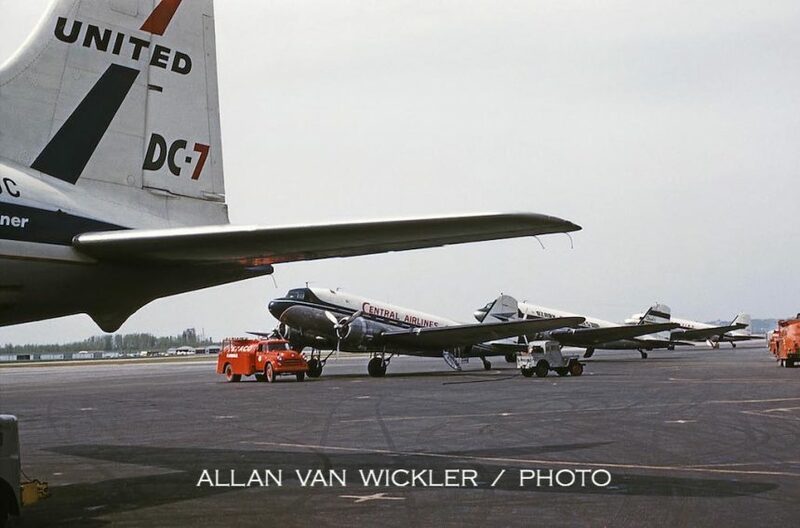 The right-hand practice gave way when DC-6s arrived with standardized left-hand entries. Barely 17 years later, brother Bob captured Convair 990A N5601, ready for engine start, apparently with support from Continental Airlines! 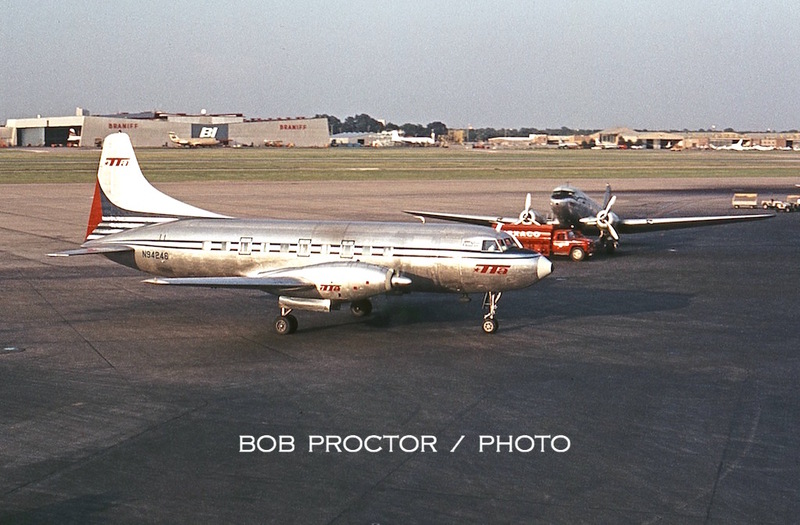 And now we visit Dallas Love Field, with three more shots by brother Bill, all taken in 1950. 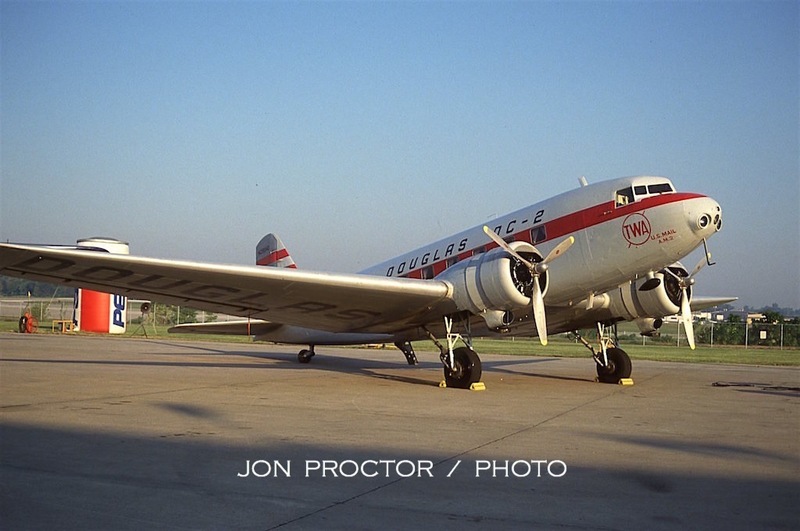 Like Mid-Continent Airlines seen earlier, Pioneer Air Lines began under a different name, this time ESSAIR (for “Efficiency, Safety and Speed by Air”) in 1938. 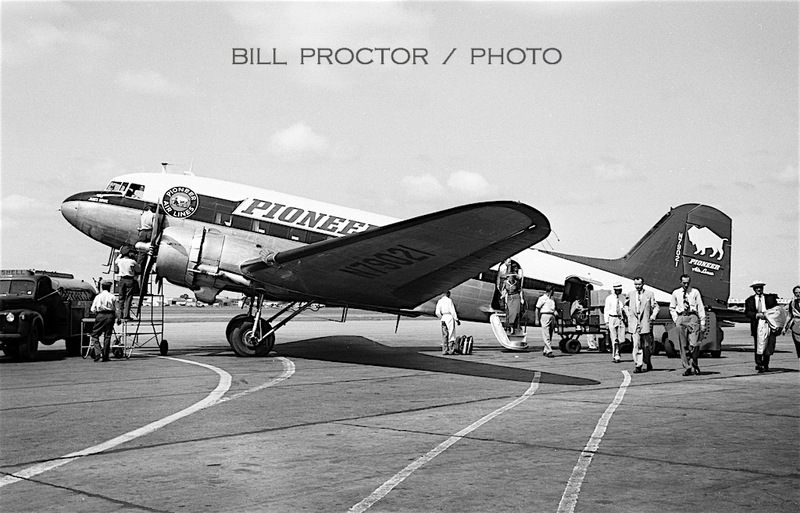 Renamed Pioneer, it began flying in August 1945. And also like Mid-Continent, it was swallowed up by another carrier, in this case Continental, on April 1, 1955. 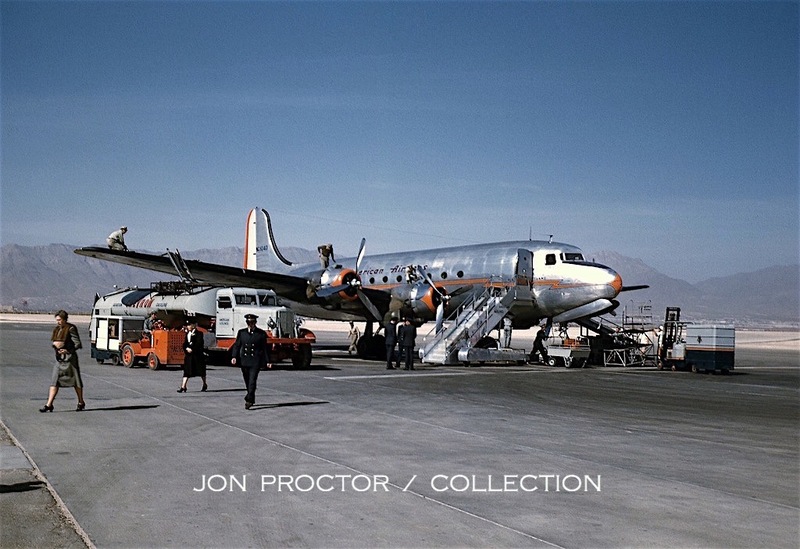 DC-3 N79021 appears to have arrived in warm weather, as evidenced by men in shirtsleeves. 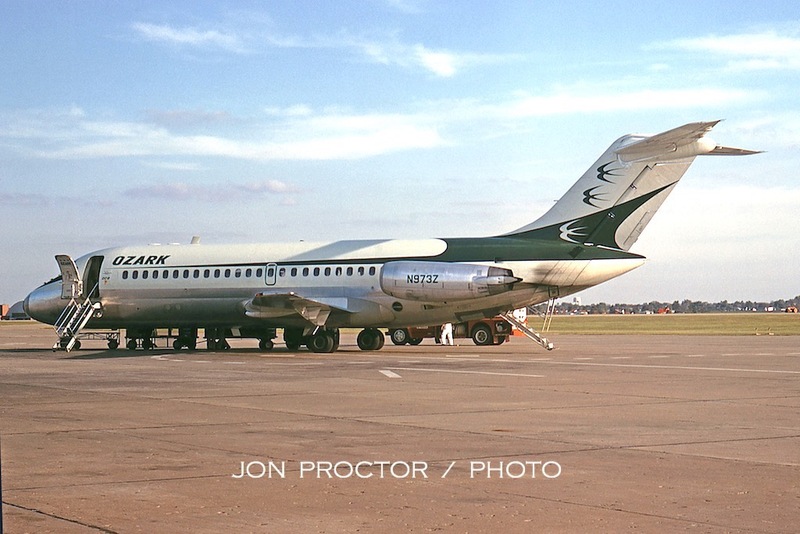 Only three years old at the time, Trans-Texas Airways first flew solely within the Lone Star State but in 20 years was serving 65 cities in the six states of Texas, Arkansas, Louisiana, New Mexico, Tennessee, Mississippi as well as Mexico. DC-3 N21768 starts engines with the help of a battery cart barely visible between its main landing gear. 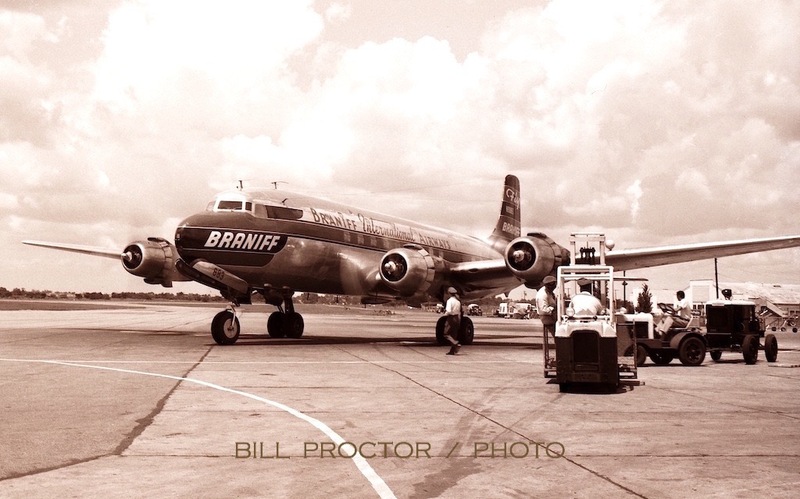 Braniff International was an early DC-6 operator. Among the six originally ordered, N90883 arrived in October 1947, serving until January 1966, when it was sold and later leased to Aeronaves de Mexico as XA-JIF. Several operators later, the Six was finally broken up in the mid-1980s. 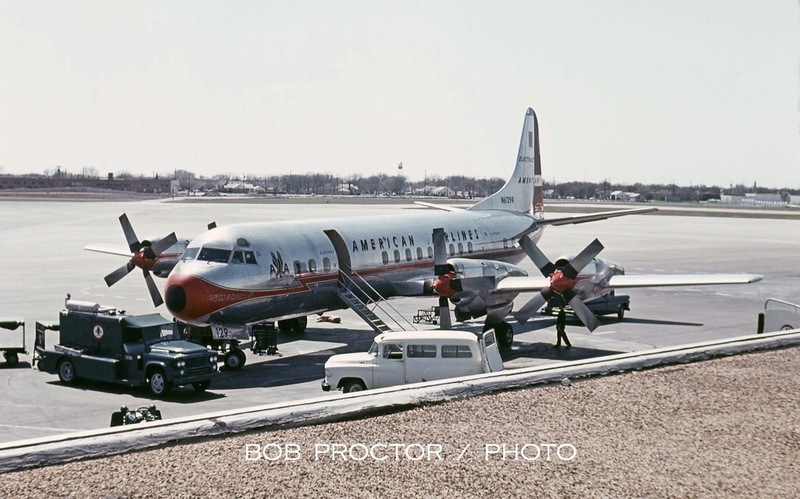 My first visit to Love Field was on December 29, 1962, en route from San Diego to San Francisco the long way, on a pass. American 707-123B N7515A brought me in via Los Angeles, and I photographed her as she departed for New York. During the stopover, I caught Continental DC-3 N16809 between assignments. 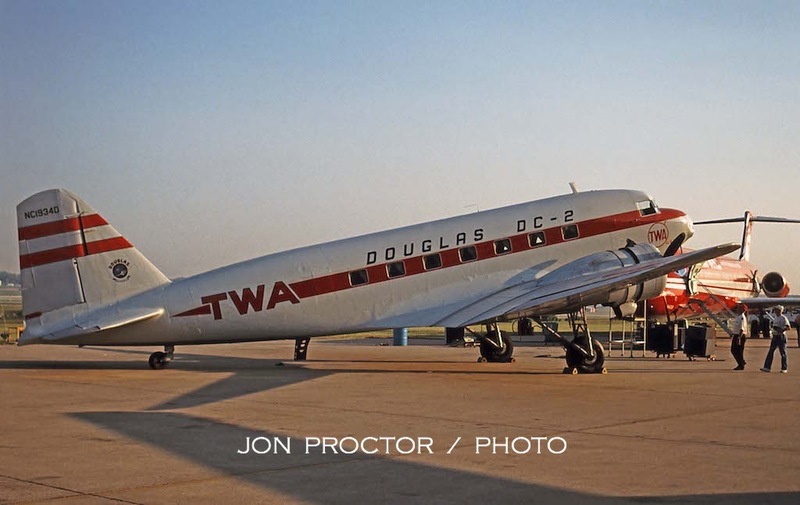 Venerable Douglas twins stayed with the airline for another three years, with the last winding up as a shuttle of sorts, between Denver and Colorado Springs. Behind the Continental, Eastern DC-7B N804D taxis into the adjacent gate. Fifty -7Bs flew for EAL over a 10-year period. 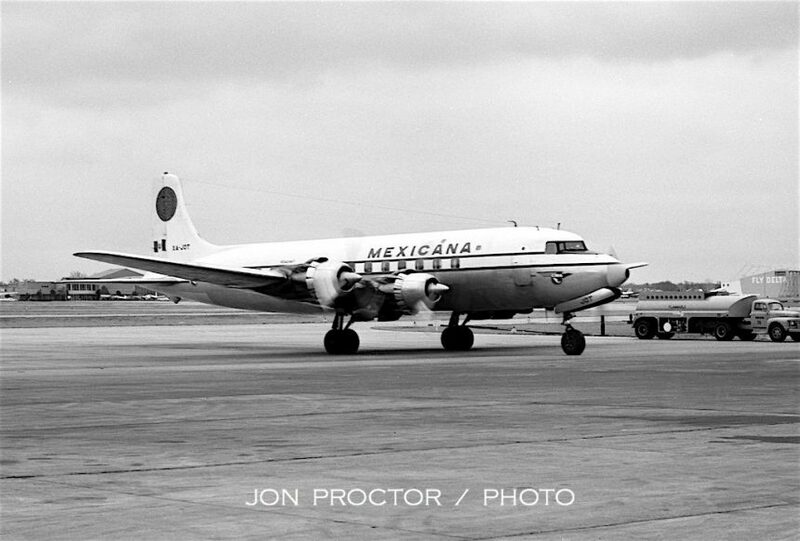 Mexicana’s Aztec livery gives away its early association with Pan Am. XA-JOT arrives from south of the border. It was delivered new to the carrier in December 1950, probably one of the last straight Sixes, and spent 22 years with its original owner. I must have had a few frames left in my slide camera, one for another look at XA-JOT. Brother Bob did some shooting from the observation deck in August 1963. 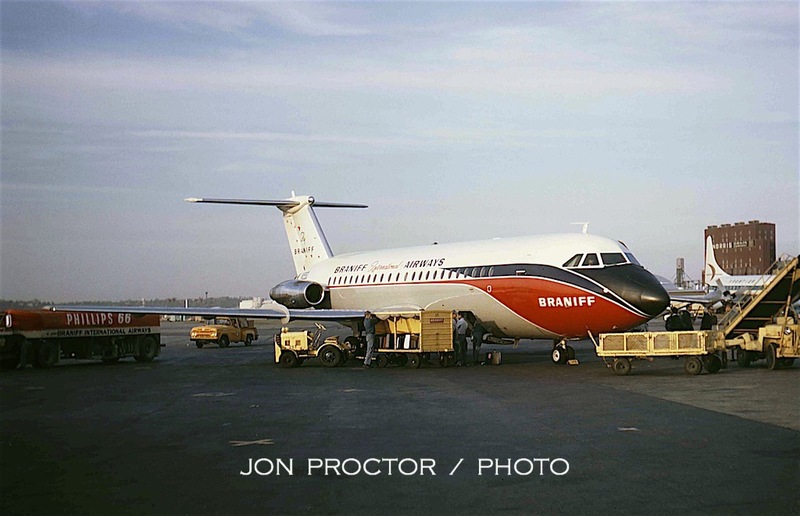 Here’s Braniff 707-227 N7073 in its delivery scheme. Note the enlarged “-227” above the aft windows. 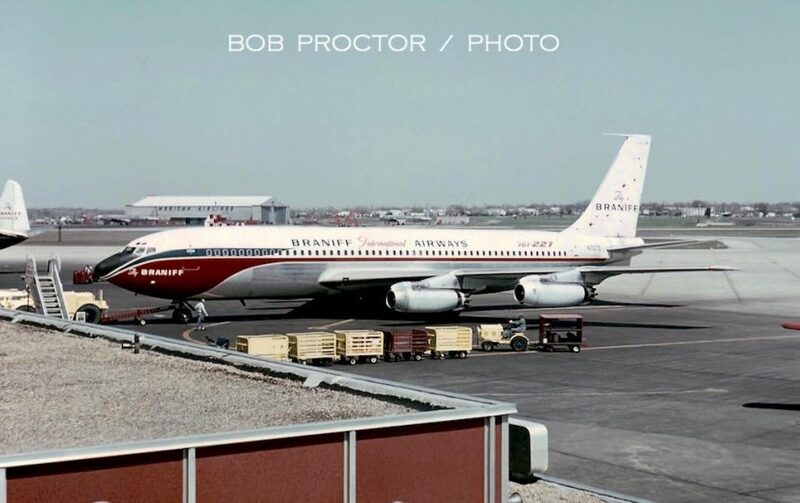 This model, only ordered by Braniff, featured the -100 fuselage with upgraded -300 engines, giving it better performance at higher altitude airports served by the airline in Mexico and South America. Trans-Texas acquired a large batch of ex-American Airlines Convair 240s, including the pictured N94224. 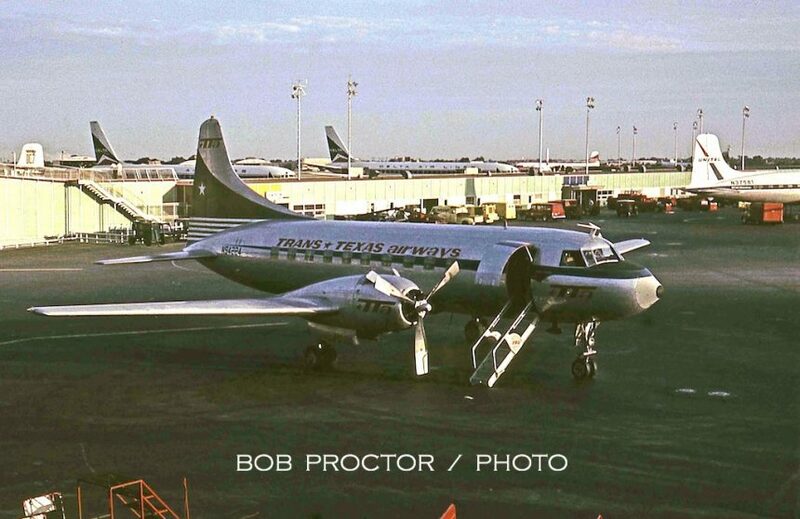 Later the fleet was converted to Convair 600 standards with Rolls-Royce turboprop engines. Bob was running out of sun when he snapped the American Airlines ramp, capturing a company 707-123B, Electra and 720B. The following March found Bob catching a few more images. Eastern 727-25 N8107N wears the type’s original livery, much more attractive than the “hockey stick” colors, at least in my opinion. Lockheed 188 Electra Flagship Los Angeles wears “Electra II” titles, indicating it has passed through the beefing-up program known as LEAP, for Lockheed Electra Action Program, following whirl mode-induced accidents. N6129A went on to fly for McCulloch International before joining the Argentine Navy. I passed through DAL on February 13, 1965, en route from Los Angeles to Orlando on Delta Convair 880 Flight 988. 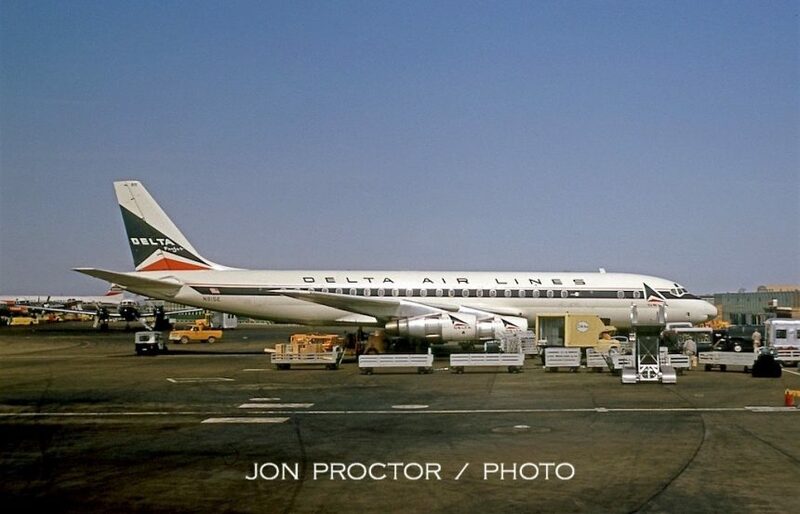 From my window seat at the gate, a profile shot appeared, of DC-8-51 N815E, still wearing the full Delta Air Lines titles. There’s quite a variety in the background if you look closely: a Braniff Electra and DC-7C, plus a nose-on Delta Convair 440. Braniff also adopted the “Electra II” moniker for its modified Electras. N9708C taxis by as we headed for the runway. Sold to LANSA as OB-R939 and named Tupac Amaru in 1969, it crashed into a mountain after takeoff from Cuzco, Peru on August 9, 1970. Bob took these five images on July 11, 1966. 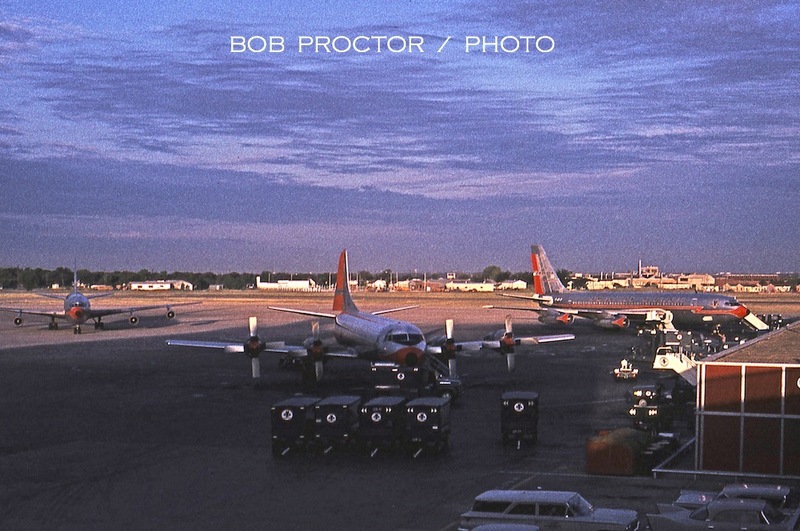 Two Boeings and an Electra adorn the Braniff ramp, with a TTA Convair 600 taxiing by. 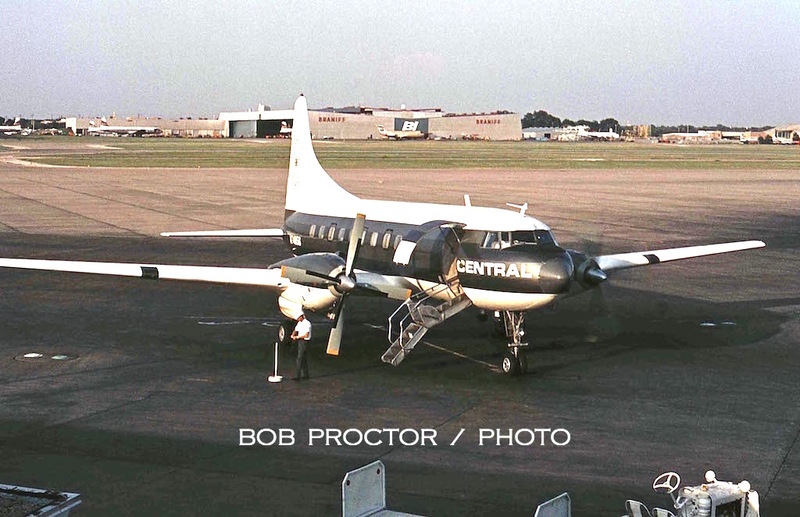 Like Trans-Texas, Central Airlines upgraded its Convair 240s to -600. 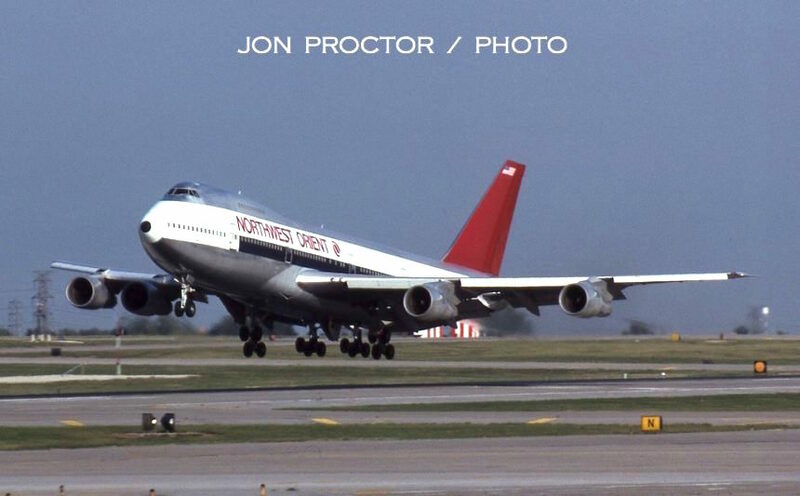 N74856 was an original factory delivery to the airline, and migrated to Frontier when the carriers merged in 1967. It later flew for Mandala-Seulawah as PK-RCR and then Airborne Express among others. 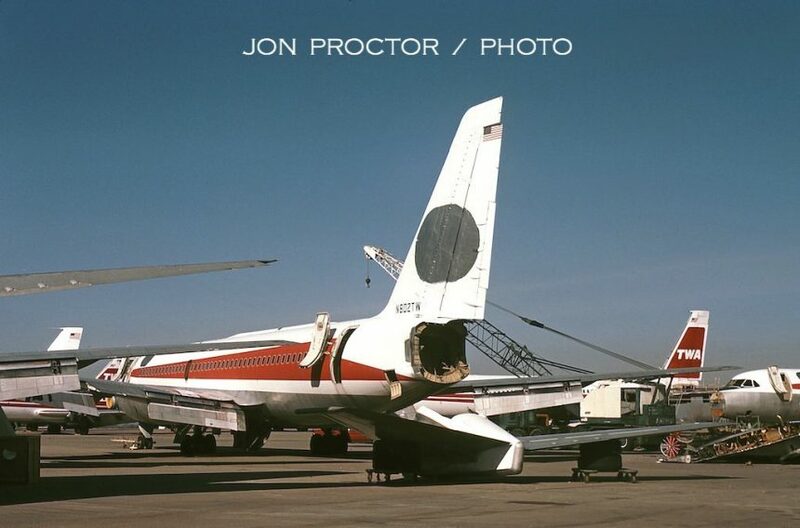 Withdrawn at Cleveland Lakefront Airport, it was broken up there. 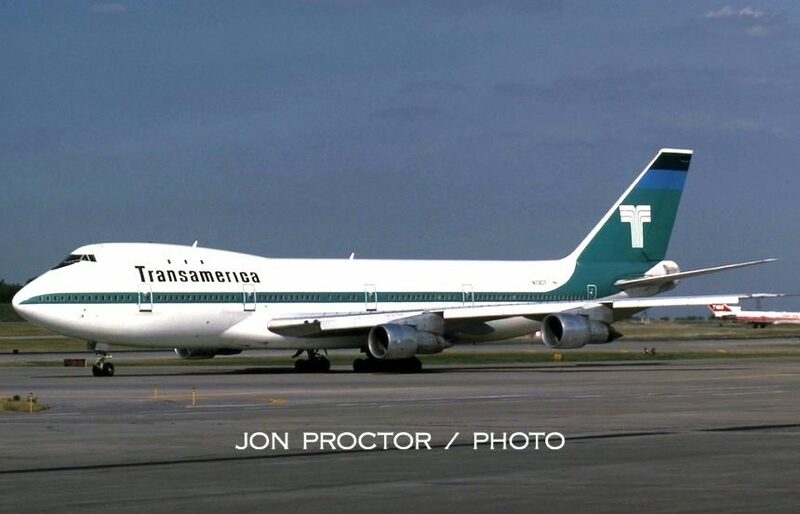 Trans-Texas adopted this updated livery on Convair 600 N94246, one of many different color schemes over the years. A little known bit of trivia: Continental operated the first turbine service at DAL with Viscount 812 turboprops in November 1958. The example shown wears the later golden tail livery, first applied to the company 720Bs. 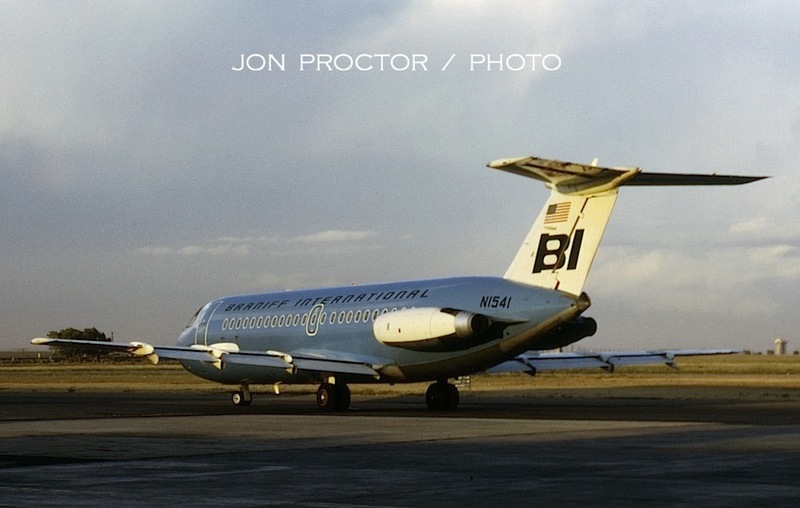 Bob photographed Braniff 1-11 N1553 less than a month before it crashed after penetrating a thunderstorm near Falls City, Nebraska. 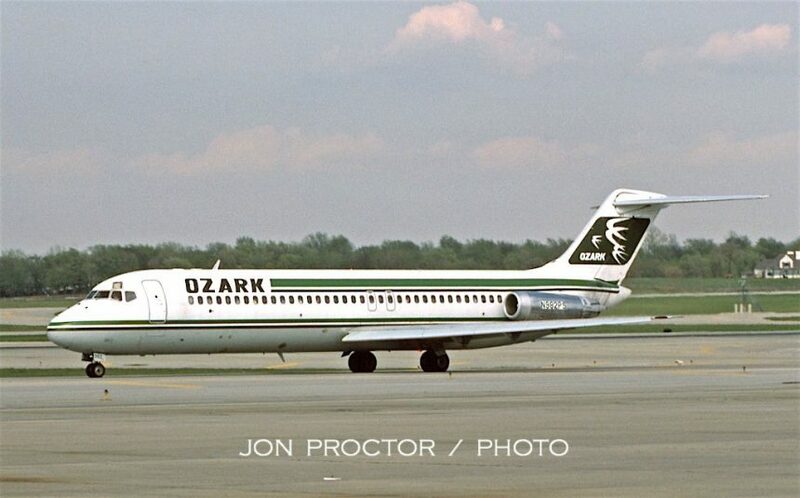 I rode Ozark DC-9-15 N973Z from Chicago-O’Hare to Peoria, Illinois on October 6, 1967, to attend a wedding. OZ opted for the optional aft ventral stairs in addition to standard forward steps, no doubt to expedite short stops at smaller stations.